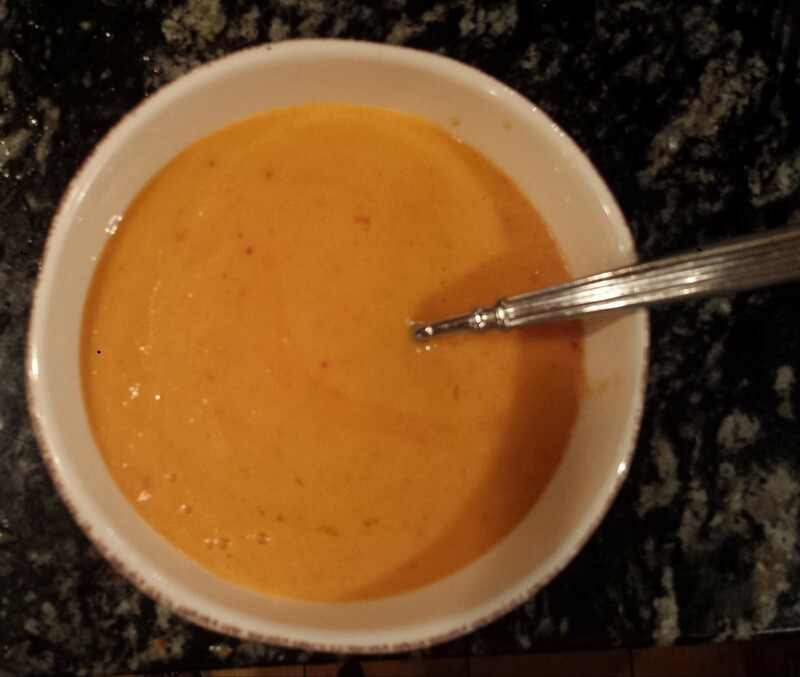 I created this recipe for Crab Bisque this summer while I was in Maine. (Yes, it was one that was deleted) My friend, Kerry, opened a bottle of chardonnay that had caramelized and she asked me to come up with a recipe to use it up. I thought the ‘aged’ wine tasted quite a bit like sherry, so I developed this recipe for Crab Bisque with Sherry, but this might be a good time to use a wine you have that has gone over the top. (Just taste it first). I also had the further restriction that my husband dislikes food made with heavy cream, so I used a combination of coconut milk and fish stock with surprisingly good results. As a bonus, coconut milk is highly nutritious and rich in fiber, vitamins C, E, B1, B3, B5 and B6 and minerals including iron, selenium, sodium, calcium, magnesium and phosphorous. Unlike cow’s milk, coconut milk is lactose free and dairy free which is a great alternative. Best of all, this recipe is ready in less than 30 minutes but only gets better as it sits and the flavors meld. It’s also good the next day if you are lucky enough to have leftovers. Tips: Bisques are known for their rich, creamy and smooth texture, so I pureed the shallots in my food processor before sauteeing. 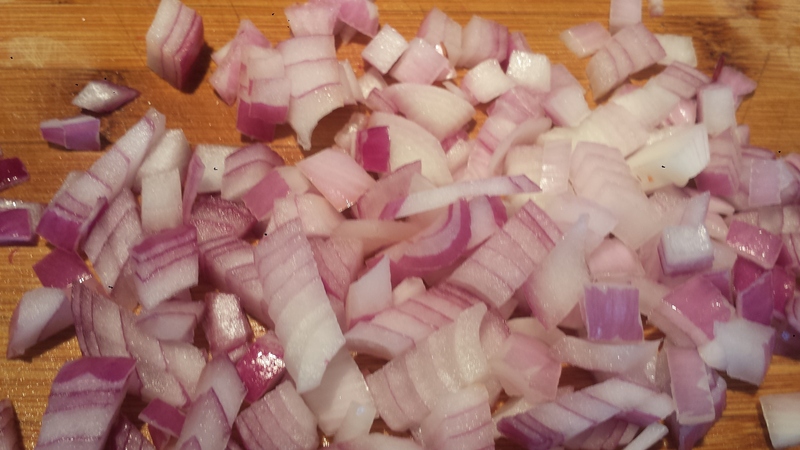 If you prefer a chunkier soup, skip this step and mince or chop the shallots with a sharp knife. 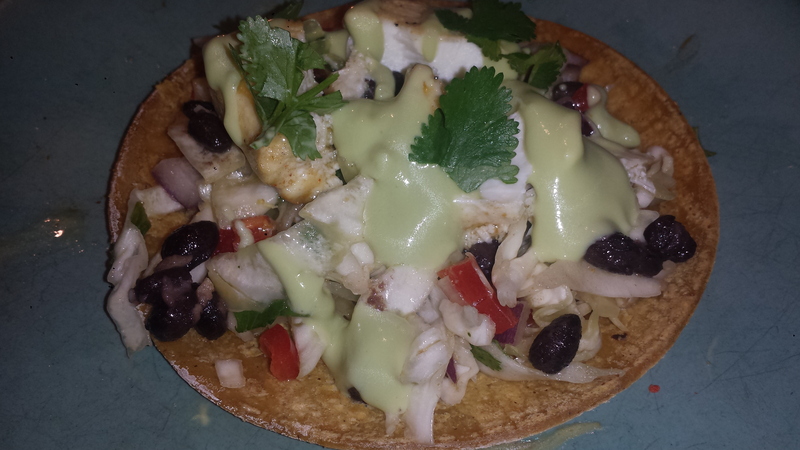 Fresh crabmeat is always wonderful, however, if you can’t find it frozen or refrigerated lump crabmeat is a decent option for soup and it is much easier than cracking and deshelling fresh crab. Old Bay is a ubiquitous seasoning, especially in the South. It is readily available in most supermarkets, however, if you don’t have it in your pantry, try substituting celery salt, red and black pepper and paprika. In a large soup pot over medium heat, melt the butter and saute the shallots until translucent, 2 to 3 minutes. Pour in the stock, coconut milk and Old Bay seasoning and bring to a simmer. Reduce the heat to low and stir in the crabmeat and the sherry. Cook until heated through, about 5 minutes. (Don’t let it boil) Taste and add salt and pepper to taste. Ladle the soup into bowls and garnish with a sprinkle of Old Bay, parsley and a drizzle of sherry . Serve immediately. Easy and delicious! Forget fussing over fancy sauces or breading and frying. This is a winner in every way! Delicate fillets of sole roasted in a sauce of lemon, capers, parsley, green onions and butter (of course). Best of all, it is ready in less than half hour and it’s such a pretty dish, your family will be impressed. I pretty much love anything that is cooked with lemon, butter, garlic and fresh herbs, so it’s no surprise that I liked this dish so much. I mean, how can you go wrong? Just toss it all together, throw it in the oven and voila! Dinner is served. 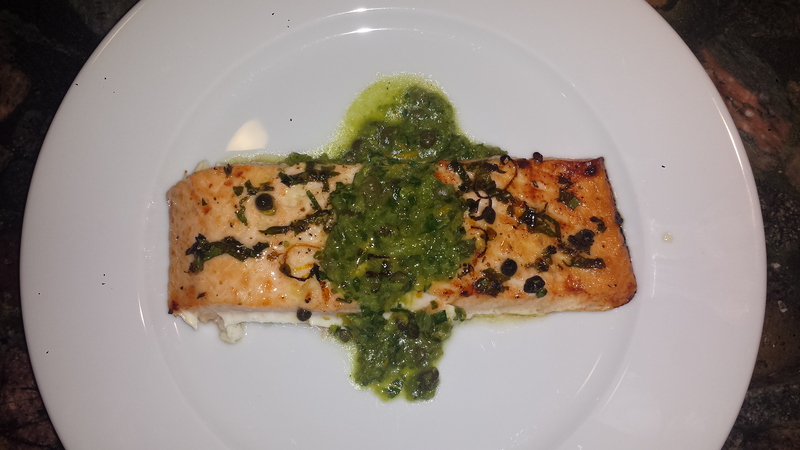 I served the sole with sauteed spinach and a combination of long grain brown and wild rice, which was great in sopping up the yummy lemon butter and provided fiber along with bumping up the nutrients. We all know that fish is a good, lean source of protein that is low in calories and fat but high in vitamins and minerals, including vitamin B. When deciding to prepare fish, make sure it comes from a sustainable source. Seafood Watch is a great source of information on purchasing seafood that is fished or farmed in ways that have less of an impact on the environment and the species. They recommend that the Best Choice is to buy sole from the Western United States and The Gulf of Alaska. TIPS: If you can’t find sole, you can substitute another light fish, like flounder or seabass. 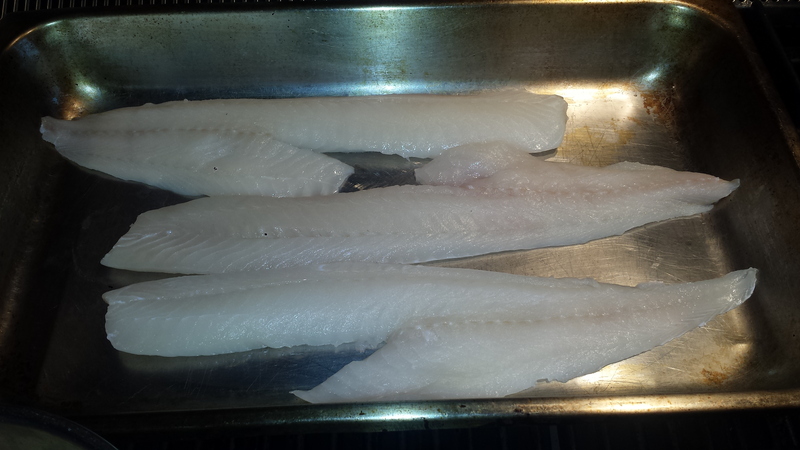 Sole is very thin so most people will eat 2 or 3 fillets, so gauge your audience and their appetites. You can also substitute shallots for the sliced green onions and chives for the slivered scallions, if need be. 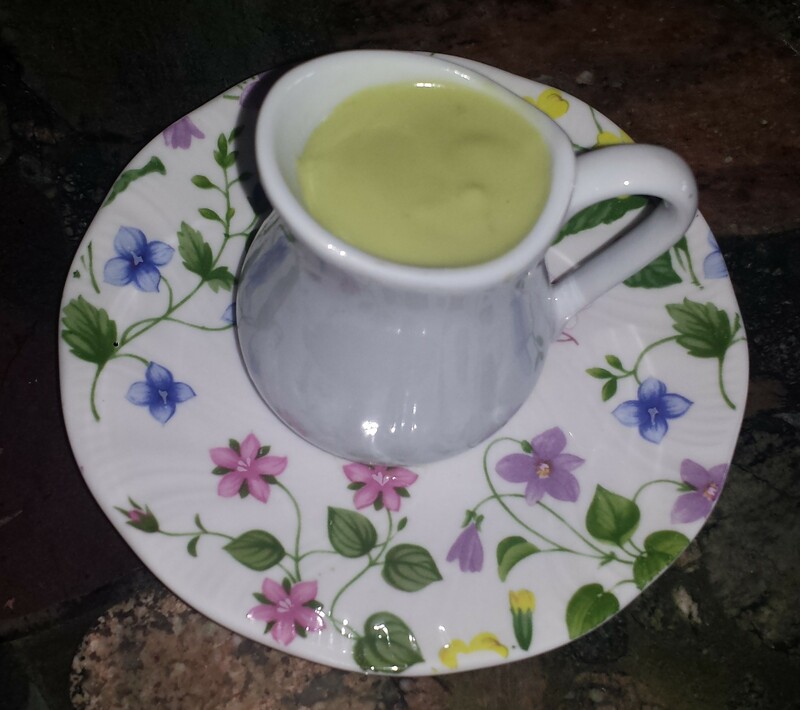 Non dairy people can successfully use a non-dairy butter that has been cultured, like Miyoko’s. 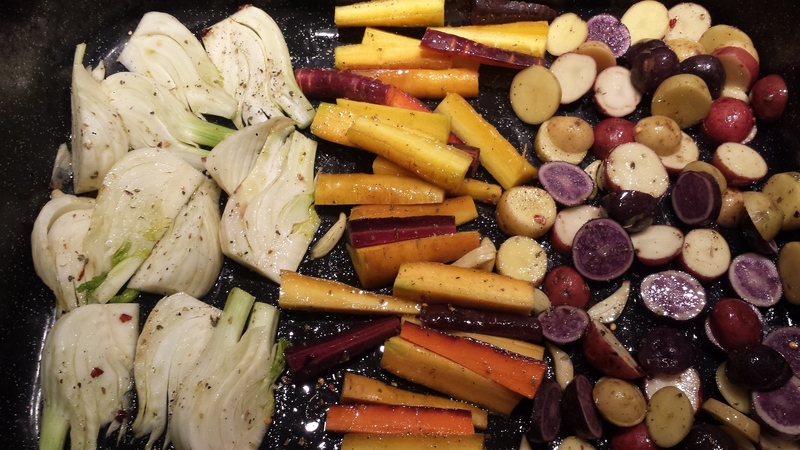 This is an easy company dish that can be prepared before guests arrive and roasted just before salads are served. 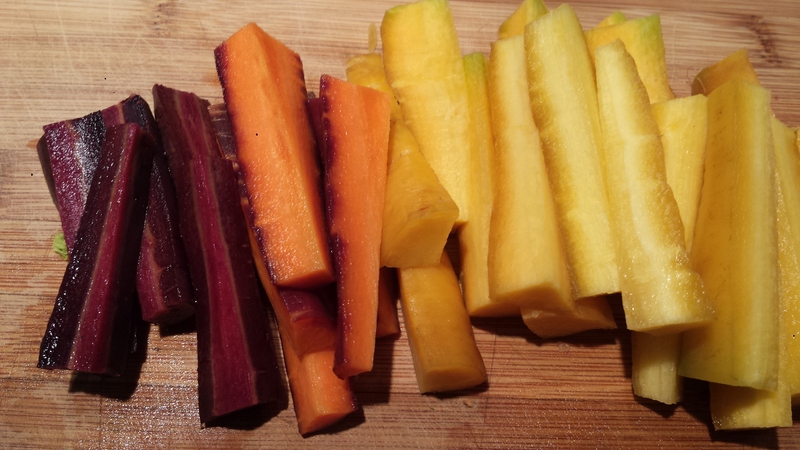 If you platter the sole, make sure you save the yummy juice to pour over side dishes or vegetables. Zest lemon and then squeeze the juice. In a small bowl, whisk together lemon juice, olive oil and melted butter, garlic, salt and pepper. Rinse and dry fish fillets and arrange them in a single layer in a large oiled baking pan. 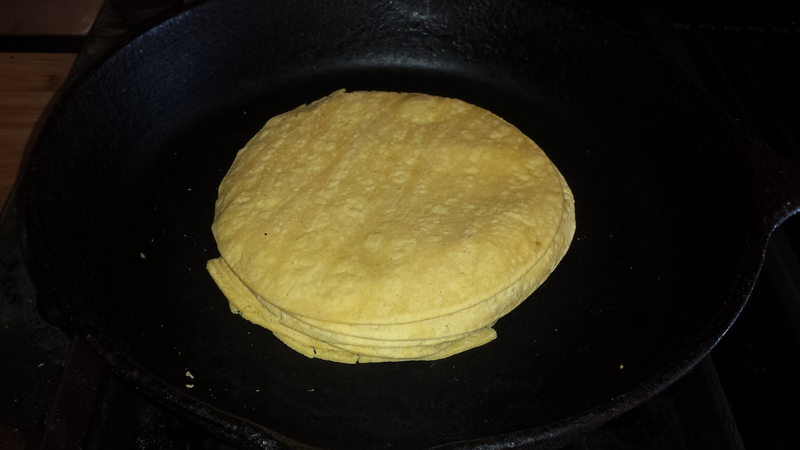 Overlapping is fine if you need to fit them in the pan. Pour the lemon butter sauce over the fish. Slice half of the scallions into thin circles and slice the rest in half vertically and then into thin julienne slivers. 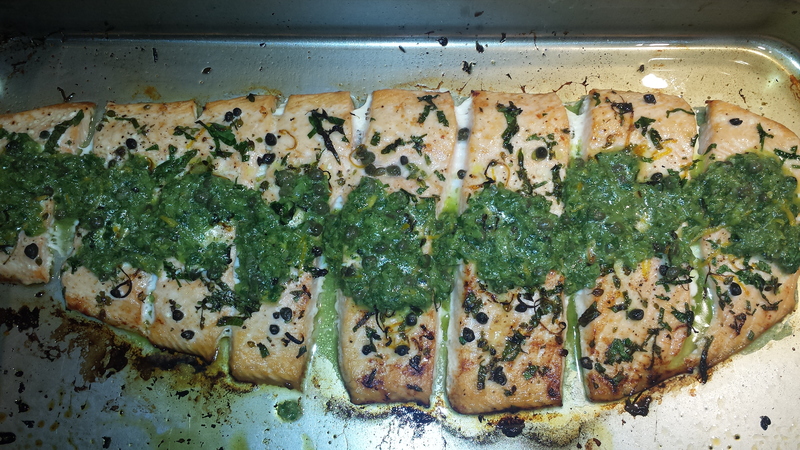 Sprinkle the fish with capers, parsley, lemon zest and green onion circles. Top with lemon slices and scallion slivers. 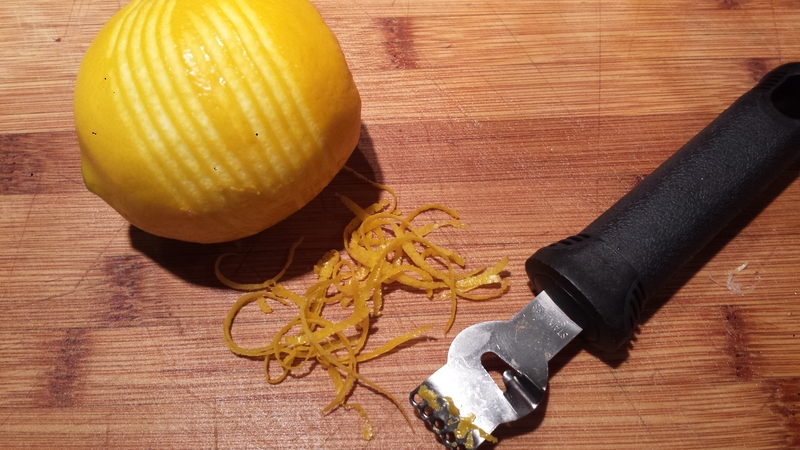 Zest lemon and then squeeze the juice. In a small bowl, whisk together lemon juice, olive oil, garlic and melted butter. 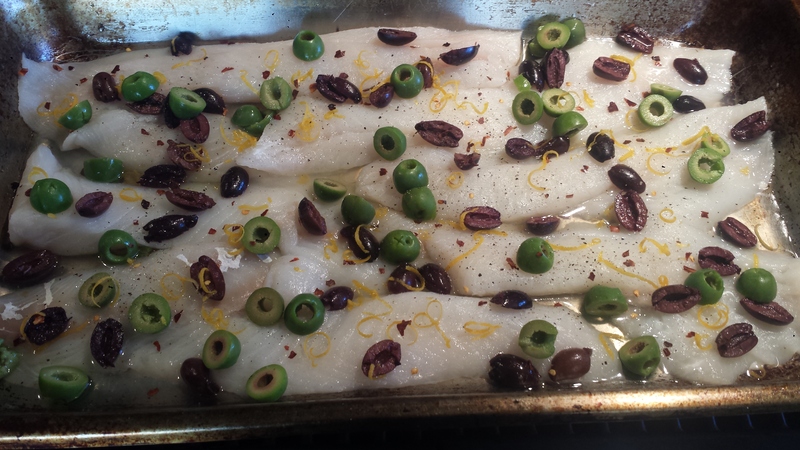 Rinse and dry fish fillets and arrange them in a single layer in a large oiled baking pan. Overlapping is fine if you need to fit them in the pan. Season with salt and pepper. 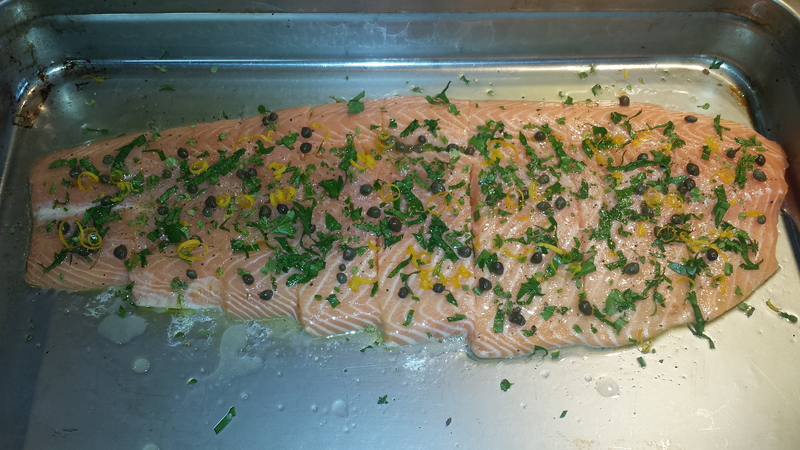 Sprinkle the fish with capers, lemon zest, green onion circles and parsley. Top with lemon slices and scallion slivers. Roast at 400 degrees for 10-15 minutes. Broil the last 5 minutes. 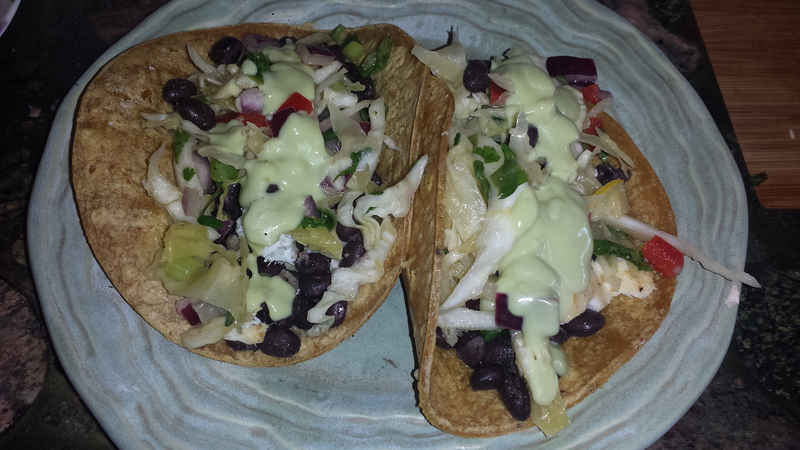 One might think with the dearth of posts from Goodmotherdiet that I am still on vacation, or at least being very lazy. Well the truth is that I was on a lovely vacation with our friends, Bob and Julie, in beautiful Anguilla (part of the British Virgin Islands) where we enjoyed 82 degrees every day, long beach walks, bike rides through the countryside, yoga overlooking the ocean and mango margaritas at sunset. Yes, we were spoiled AND it was so nice to get out of the rain! I flew back several days ago, however, my suitcase, in a rogue attempt to extend it’s vacation in the tropics, stayed behind in St. Maarten. Nestled in among my bathing suits and beach wraps was, you guessed it, my laptop charge cord. I had my laptop but without power it was very hard to use. Rest assured that I do have several new recipes to post, once I get the photos downloaded and recipes written. So stay tuned for Pasta with Parm Roasted Cauliflower and Power Greens and a Tofu Noodle Bowl. The beauty of this guilt inspired post though is that it is really a triple whammie, three recipes that I think all work well together, but you can pick and choose at will. Make just one or all three! I love this flavor combination. Halibut is a mild but flavorful fish with a really great texture that is gets crispy golden on the outside and light and flaky on the inside when pan roasted. Served over the top of roasted fennel and creamy, smooth garlic mashed potatoes with the delicious and savory lemon caper sauce drizzled over the top of everything…heaven! 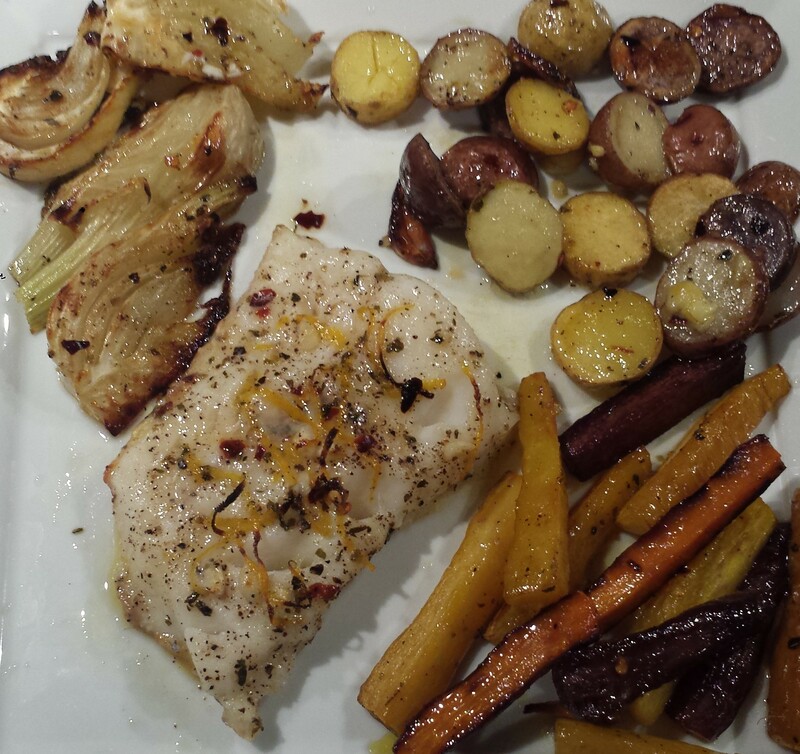 The halibut recipe is easy and fast. 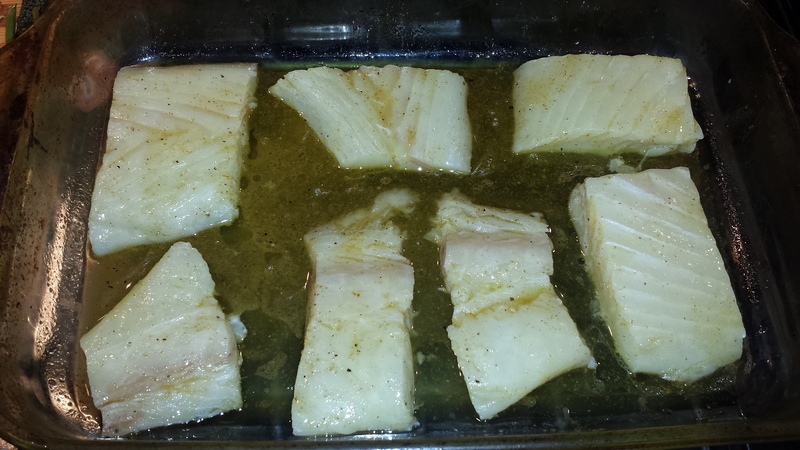 The halibut cooks in about 6 minutes and the sauce takes another 5 minutes and there is very little prep work. Add a salad and dinner can definitely be on the table in 15 minutes! The fennel and mashed potatoes take a little longer but are totally worth it. I love fennel, both raw in salads and cooked, but my favorite preparation is simply roasted with a drizzle of olive oil and a sprinkle of salt and pepper. 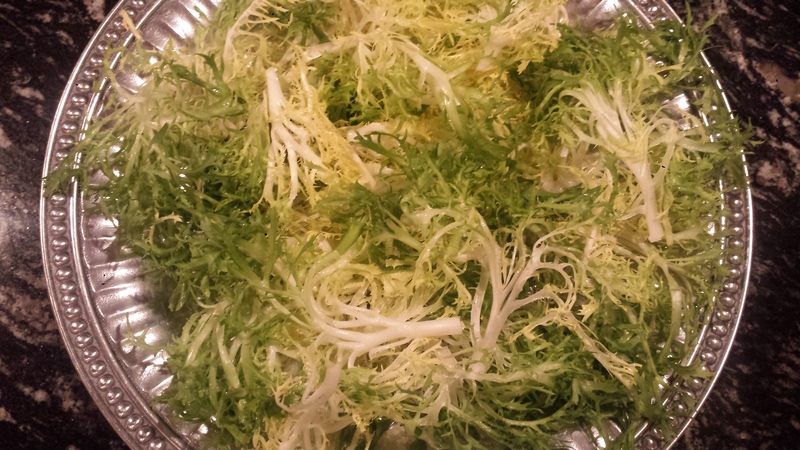 Fennel has a very elegant taste and has a delicate but sweet flavor when roasted. 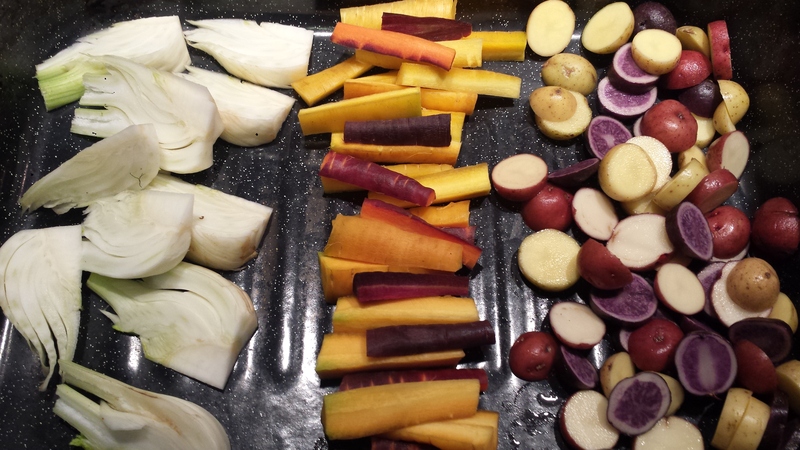 If you slice the bulbs into ‘steaks’, it is a very pretty presentation too. I’ll bet you didn’t know (I didn’t either) that fennel is in the carrot family. I would not have guessed that little fun fact. Fennel is thought to have many health benefits and has been used in natural remedies since ancient times. It is loaded with nutrients; iron, phosphorous, calcium, magnesium, manganese, zinc and vitamin K content present in fennel all contribute to building and maintaining bone structure and strength, so ladies in particular, take note. TIPS: I have written this as three separate recipes and you should be able to print them that way. 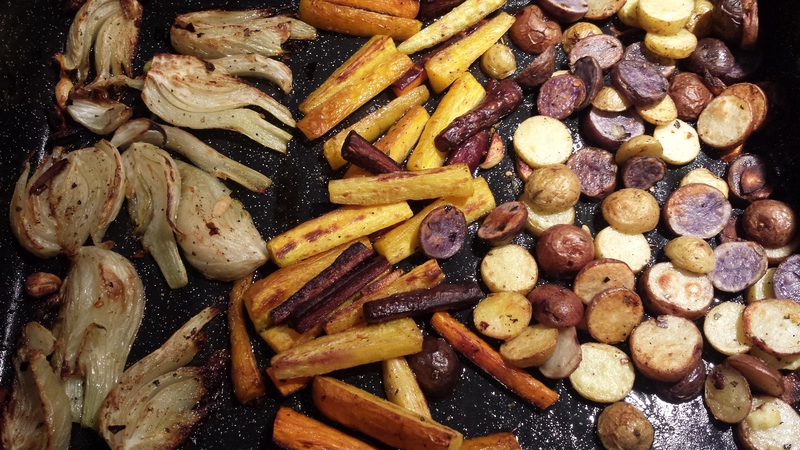 If you want to make all three (which I recommend), start by roasting the garlic and getting the potatoes boiling. Then slice the fennel, drizzle with olive oil, sprinkle with spices and put that in the oven with the garlic. Finish off the mashed potatoes and take the fennel out of the oven and set aside. 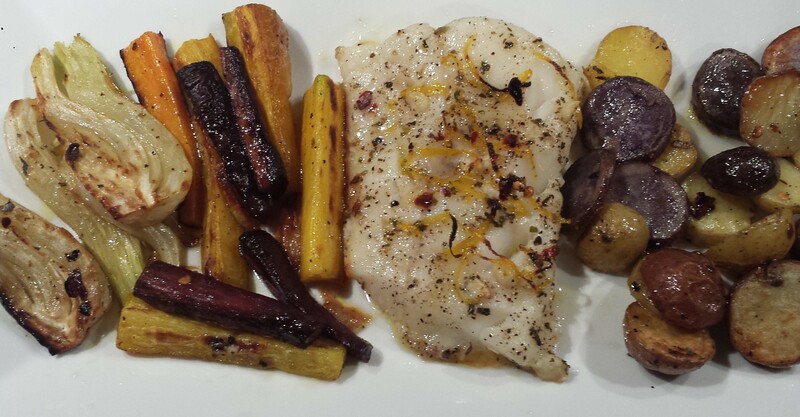 Pan sear the halibut, make the sauce and dinner is served! Note: garlic can be roasted way ahead of time and left to cool. Season both sides of fillets with salt, pepper and Old Bay, if using. Heat olive oil and butter in a large pan over medium heat until very hot. Place halibut fillets in pan and sear for 3-4 minutes, then flip and cook the other side for another 2-3. 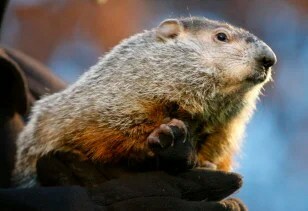 Remove from heat and loosely cover to keep warm. Lower heat and add the garlic and cook until fragrant. 2-3 minutes. Add lemon juice and wine and bring to a boil. 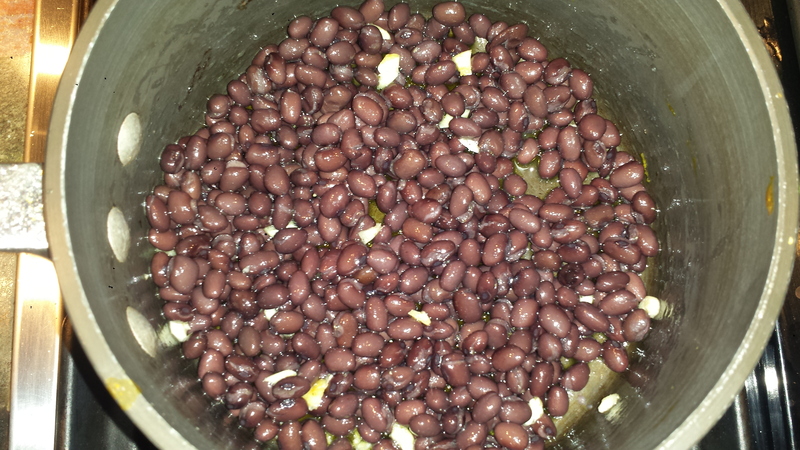 Reduce heat and let simmer 5 minutes, until thickened. 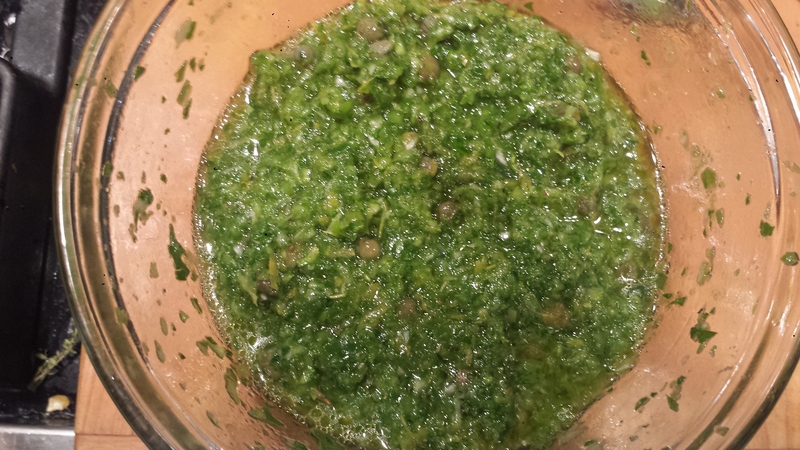 Stir in the capers, parsley and lemon zest, taste and adjust seasoning, if necessary. Transfer fish to serving plates and spoon sauce over the top. 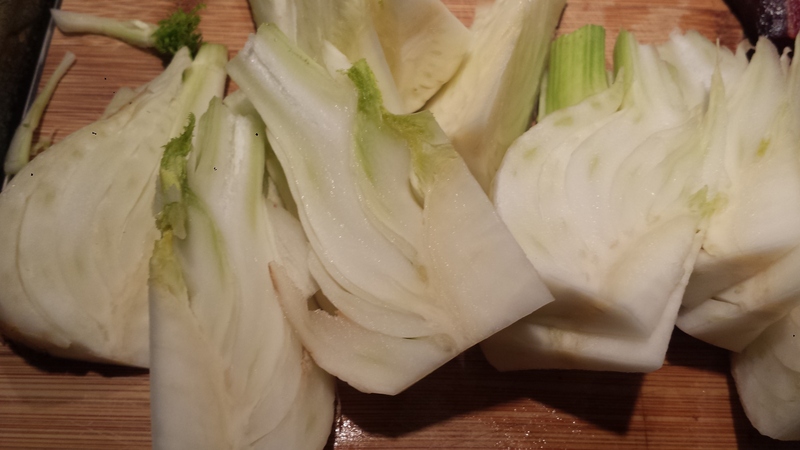 Remove fennel stalk and cut lengwise into thick slices. Brush or spray both sides with olive oil and sprinkle with oregano, salt and pepper. Roast at 425 degrees, turning once for about 25 minutes. Slice top off of garlic bulb, exposing the cloves. Drizzle with olive oil and wrap in foil. Bake at 425 degrees for about an hour. Remove from heat and let cool. Peel potatoes and cut them into chunks. Boil about 20 minutes, or until very soft. Drain potatoes and place them in a large bowl. 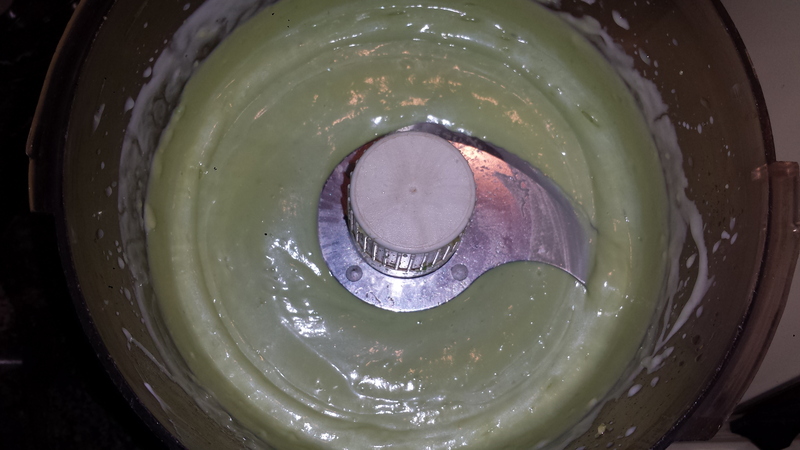 Squeeze garlic into potatoes and puree using a potato masher or food processor. Add milk, butter and salt and pulse or stir to combine. Season both sides of fillets with salt, pepper and Old Bay, if using. Heat olive oil and butter in a large pan over medium heat until very hot. 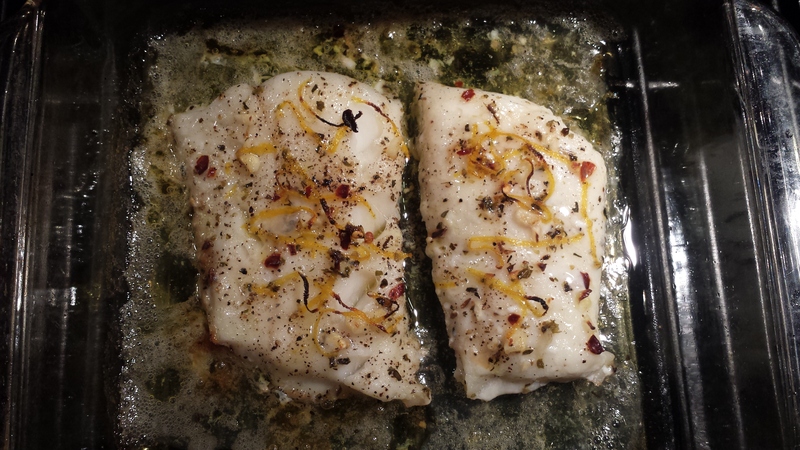 Place halibut fillets in pan and sear for 3-4 minutes, then flip and cook the other side for another 2-3. 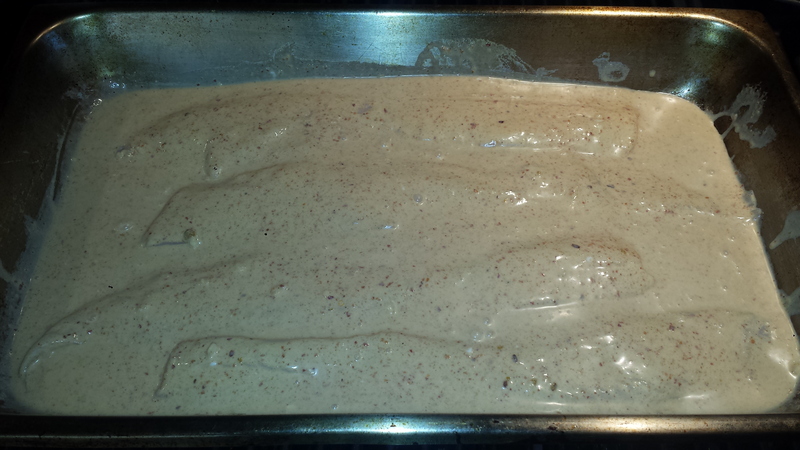 Transfer to serving plates and spoon sauce over the top. Peel potatoes and cut them into chunks. Boil about 20 minutes, or until very soft. Drain potatoes and place them in a large bowl. Squeeze garlic into potatoes and puree using a potato masher or food processor. Add milk, butter and salt and stir to combine. Frisee is an under-appreciated green, at least in the Univted States. 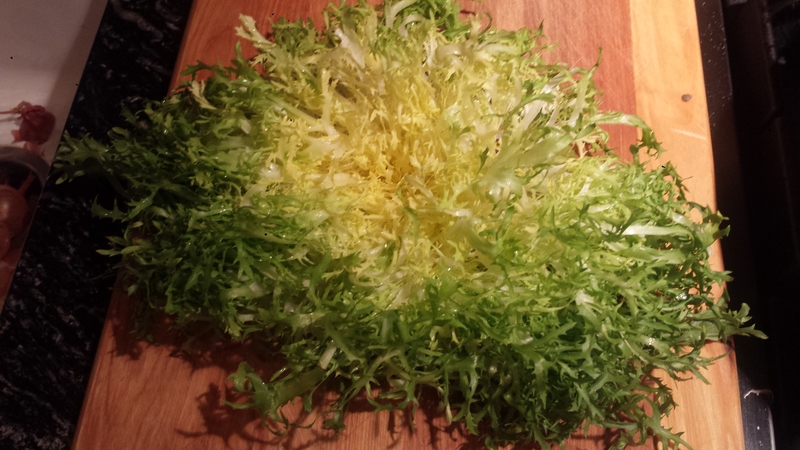 Frisee, also called curly endive, is part of the chicory family, along with Belgian endive, radicchio, and escarole. Frisee is packed with nutrients, and very low in calories like most greens. It is an excellent source of folic acid, vitamin A and vitamin C, with approximately one third the daily recommended amount of each, in a single serving. 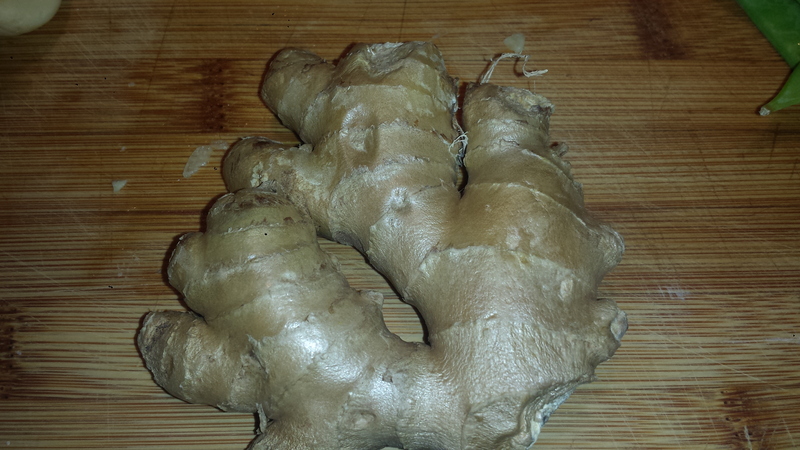 It is also a good source of vitamin K, and manganese. It’s slightly bitter and nutty flavor makes it a nice addition to salads but it works best mixed with milder greens or with complementary flavors like sweet citrus, earthy lentils and a tangy vinaigrette. 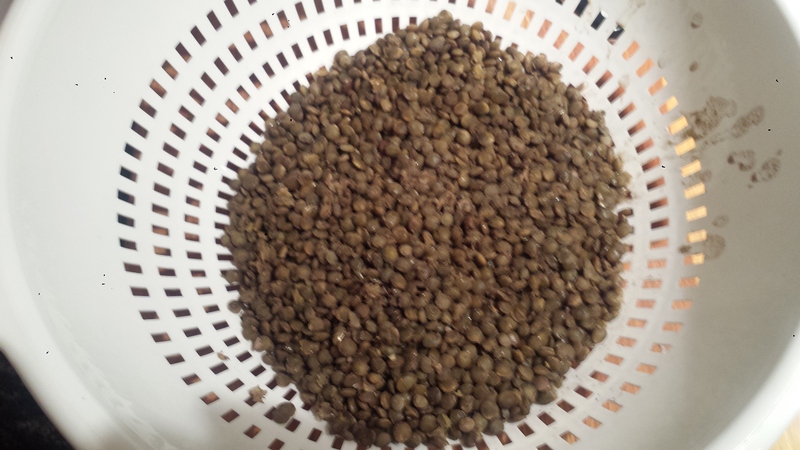 I often use French green lentils (De Puy) which I think are the most flavorful and they keep their shape when cooked, unlike red lentils which are soft and split open, making them perfect for soups and stews. Brown lentils, which are the most commonly available, can be substituted. Just be careful not to overcook as they also can become too soft. Lentils not only delicious, they are high in protein, low in fat and are a good source of fiber and vitamins and minerals, including iron. TIPS: When purchasing scallops, try to buy dry sea scallops. Scallops are often labelled ‘dry’ or ‘wet’. If they aren’t labelled, ask. ‘Wet’ scallops are treated with a solution called STP (sodium tripolyphosphate), which helps the scallops maintain their moisture. 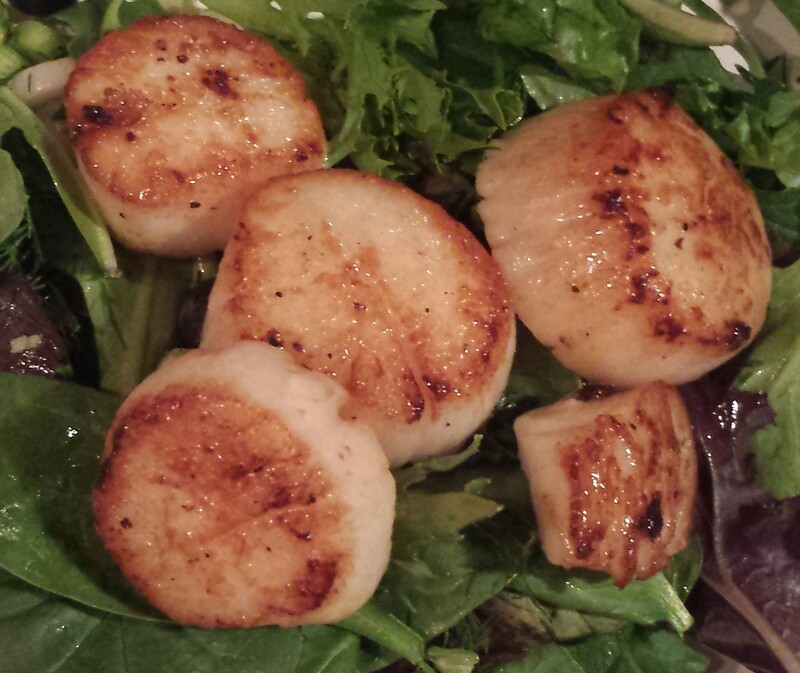 The STP solution gives scallops a longer shelf life and keeps them plump and fresh looking. As a result, you’ll not only pay for the added water weight (meaning you get fewer scallops per pound and possibly scallops that are less than fresh) In addition, you’ll also have trouble browning these scallops—no matter how hot your pan—because of all that excess moisture. 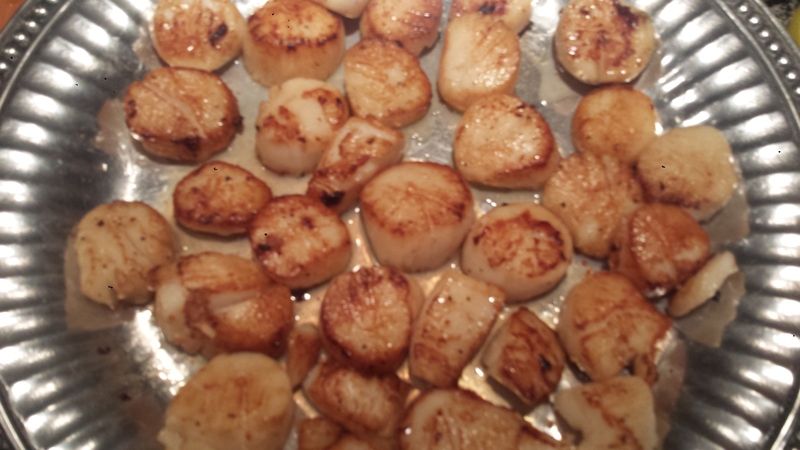 If you have had trouble browning scallops in the past, this could be the reason. You will still rinse and dry your scallops which shouldn’t effect the browning as long you dry them well with paper towels. Cook lentils as directed but don’t over cook. They should be al dente. Pour off any excess water, remove from heat and set aside to cool with lid off. Slice tomatoes into wedges. 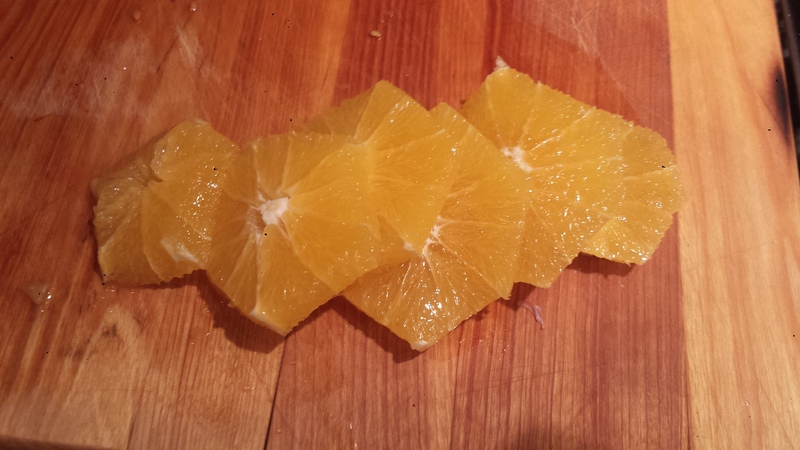 Peel oranges and slice into rounds and then halves. Pull frisee apart and place in one a large platter or bowl. 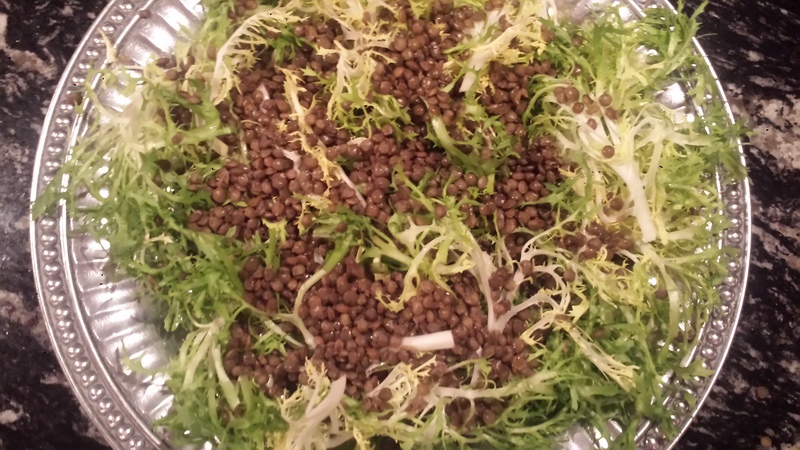 Spread cooled lentils over frisee. 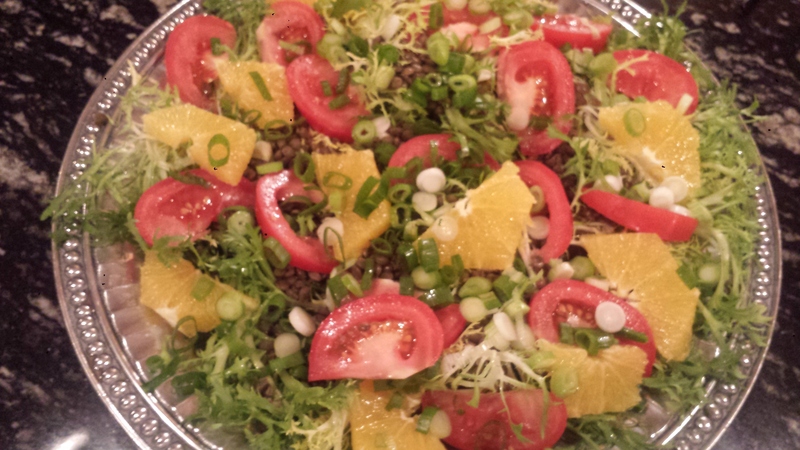 Top with tomatoes, orange slices and scallions. 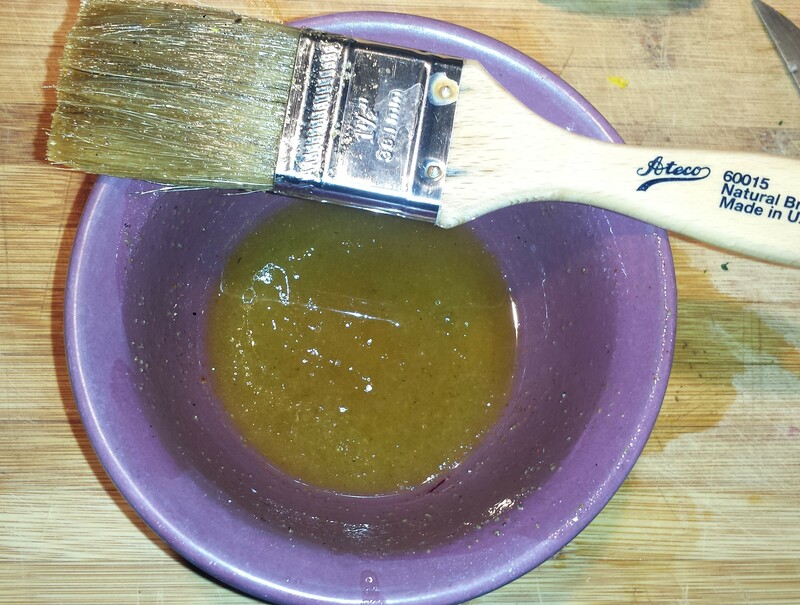 Whisk all vinaigrette ingredients together in a small bowl and set aside. 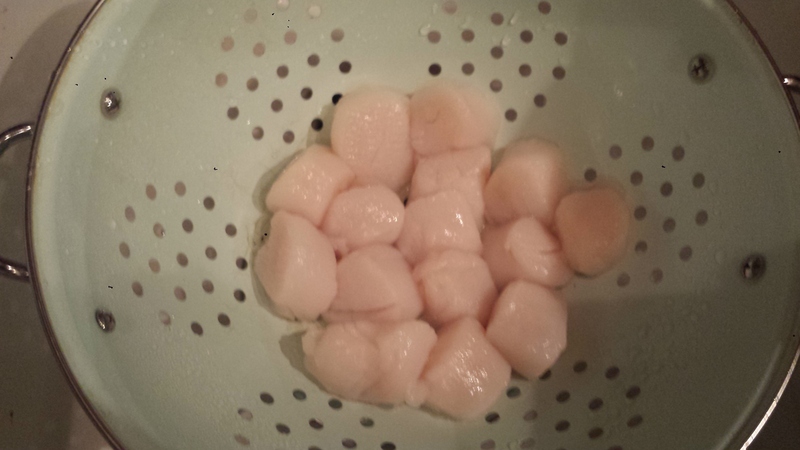 Rinse and dry scallops. Heat olive oil over medium high heat until the pan is very hot. 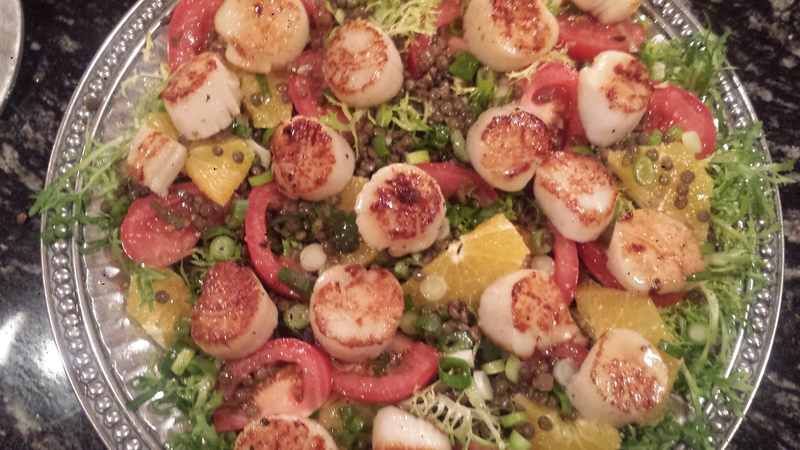 Arrange scallops in a single layer, uncrowded. Sprinkle with salt and pepper. Cook about 1 1/2 to 2 minutes and flip to cook the other side for another 1 1/2 minutes. Remove from heat and place on top of salad. Sprinkle with vinaigrette and serve immediately. Remove from heat and place on top of salad. Sprinkle with vinaigrette and serve immediately. 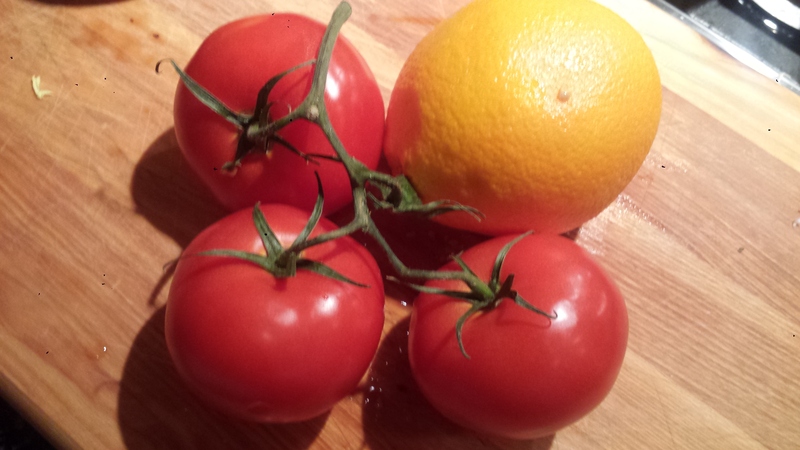 Looking for something light and summery – and FAST to make for dinner? 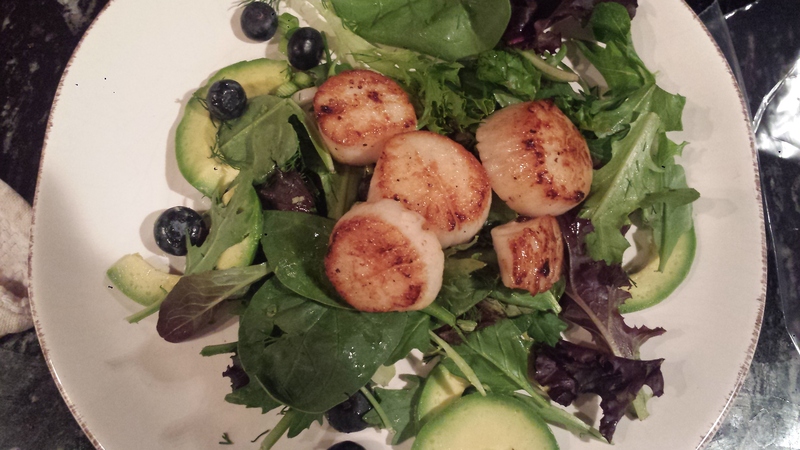 How about a warm scallop salad with perfectly seared sea scallops over a bed of mixed greens, avocado and, I’m in Maine – so blueberries. 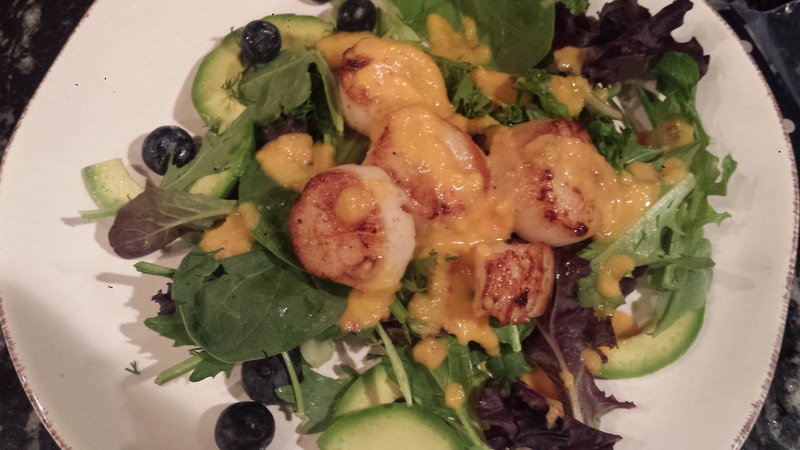 Top all of this with a spicy, sweet mango vinaigrette for a lovely summery taste sensation. 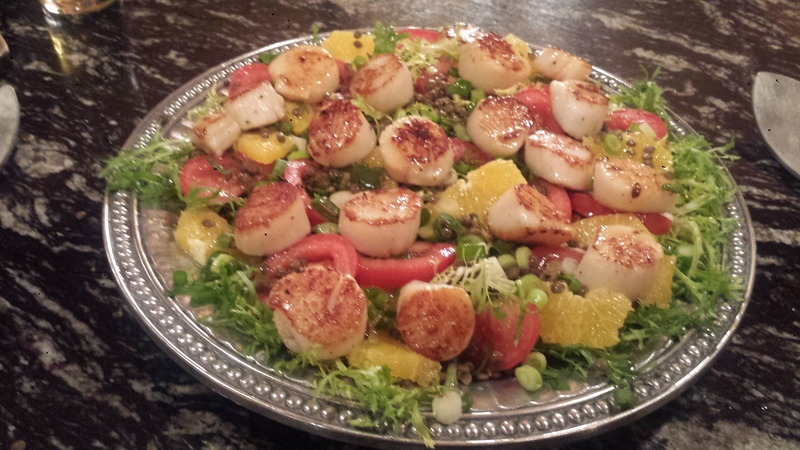 Best of all, you can whip this up in 20 minutes or less, depending on how fast you are at putting things together – five minutes or so to make the salad, another five to make the mango vinaigrette and then the scallops only take 3 minutes to cook. Done and delicious! 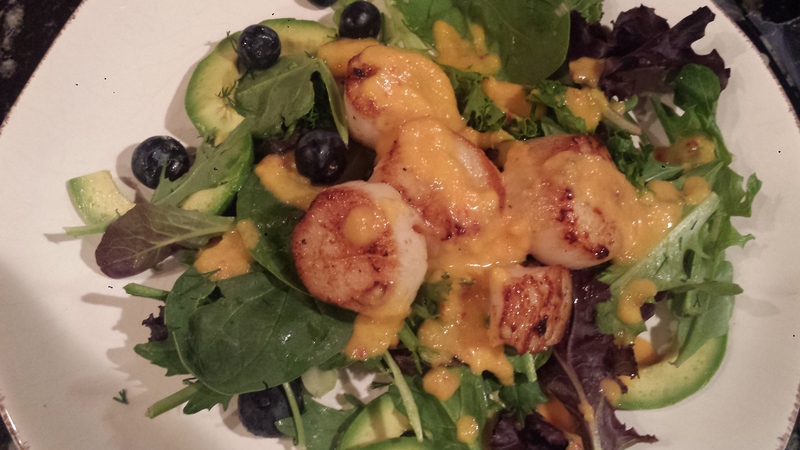 Scallops are a great choice for seafood lovers. They are not only delicious but low in calories and high in protein. 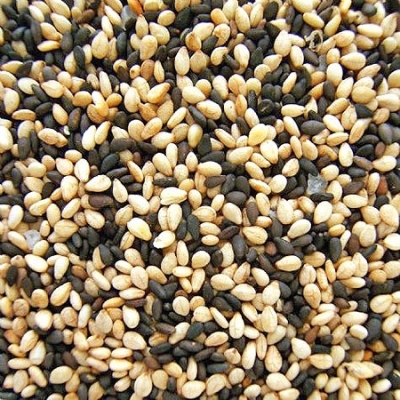 They are excellent sources of Vitamin B12 and omega3 fats. 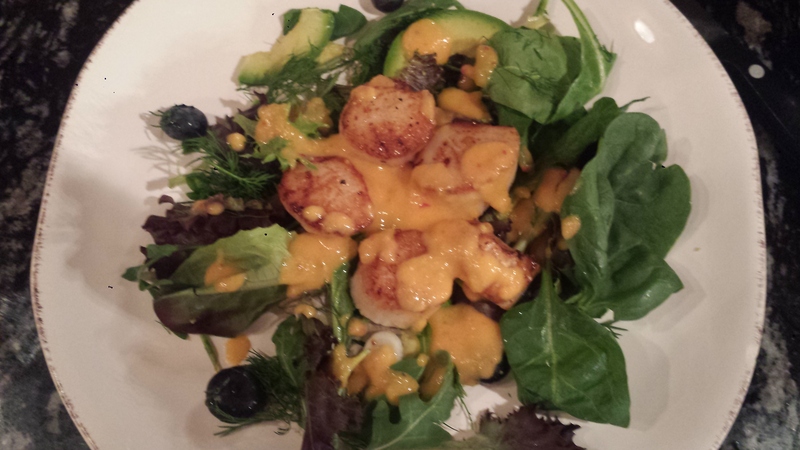 Sea scallops are also a good environmental choice. According to Seafood Watch, wild-caught scallops are a “Best Choice” or “Good Alternative,” depending on where and how they’re harvested. Worldwide, farmed scallops are a “Best Choice” because farming methods have little impact on the surrounding environment, however, some countries have questionable farming methods, so I would check before buying. I happened upon this mango vinaigrette when I noticed I had some leftover sliced mango that needed to be used up and thought it would make a tasty salad dressing. 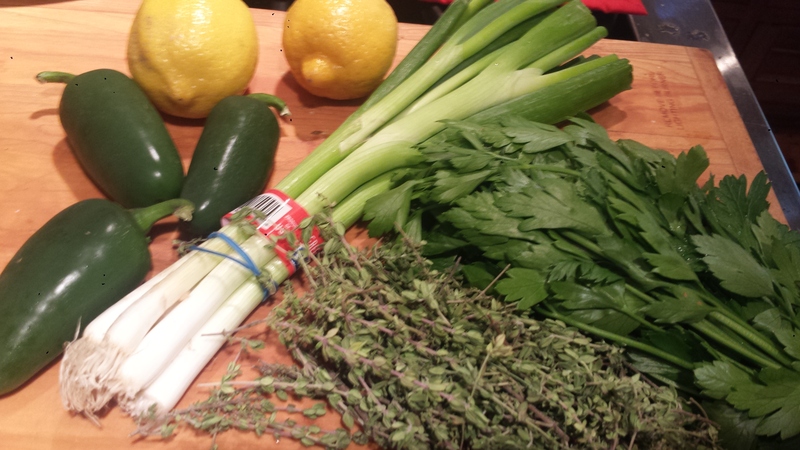 I grew up with homemade dressing (Thanks Mom!) so I usually make my own. You will rarely see me pulling a bottle of store-bought dressing from the fridge. Truly spoiled. I just don’t like that bottled taste they all have. 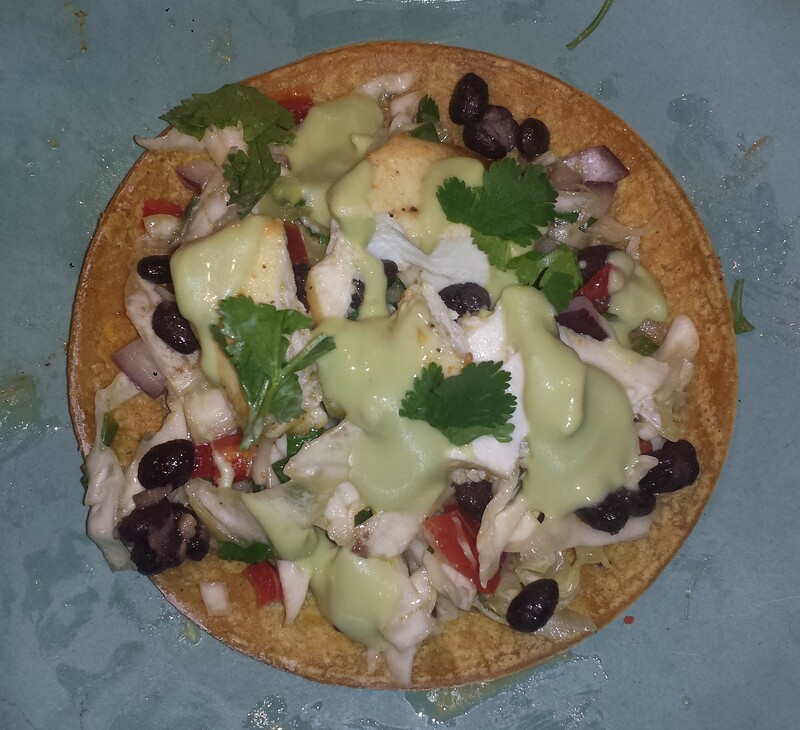 Making it fresh is so worth the extra few minutes, however, if you have a dressing you love, go for it. With a fruity dressing, I like to pair something savory or spicy like jalapeno or, in this case, red Fresno chili pepper, which also adds a nice color to the vinaigrette. This otherwise simple dressing also has oil and lemon juice with a sprinkle of salt and pepper. It was great paired with the greens and warm scallops. It would also be tasty on grilled shrimp or fish. Sometimes simpler is better as you can taste each and every flavor. TIPS: If blueberries are not available where you are, substitute another fruit, like ripe peaches, or sliced red or yellow bell pepper. 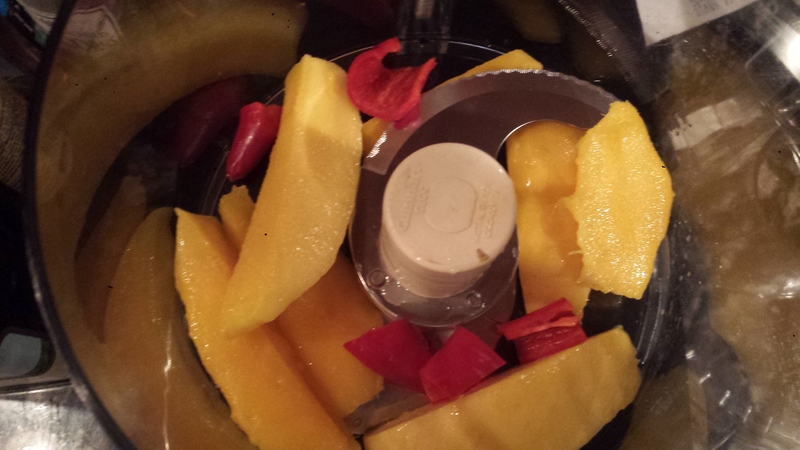 You can use fresh or frozen (defrosted) mango slices or chunks. If you are using a fresh mango, click HERE for a short video on how to cut a mango from cooking pro Martha Stewart, herself. It’s easy and brilliant. If you are still struggling to remove the large mango seed, you should check it out. 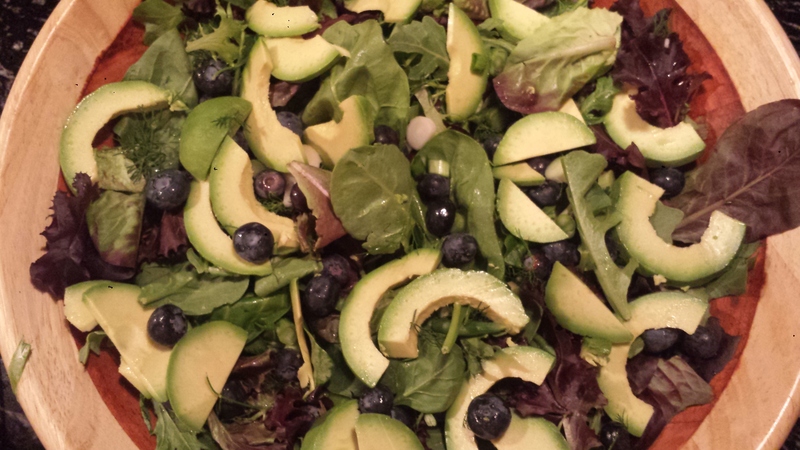 Place mixed greens in a large salad bowl along with the blueberries, scallions and avocado. Rinse and dry scallops with a papertowel, sprinkle with salt and pepper and set aside. Add the butter and oil to a wide saute pan on high heat until almost smoking. Add the scallops in a single layer round side down, making sure they are not touching each other and sear for 1 1/2 minutes on each side. 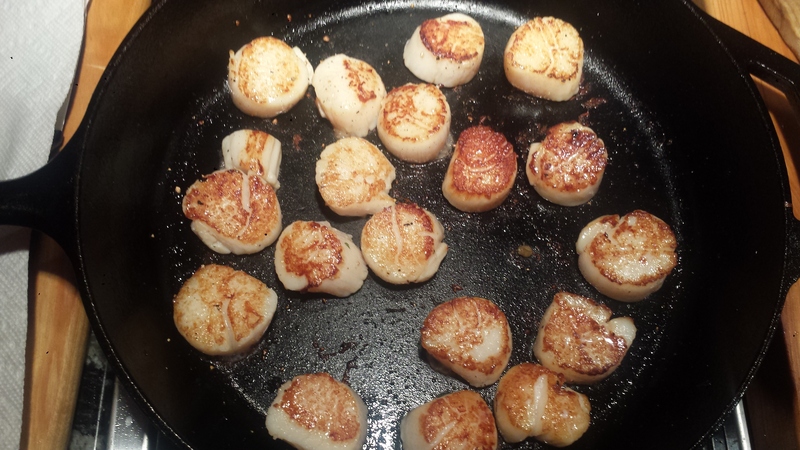 The scallops should be golden brown on both sides but still soft in the center. Don’t overcook or they will get tough and chewy. Cook in batches if necessary. 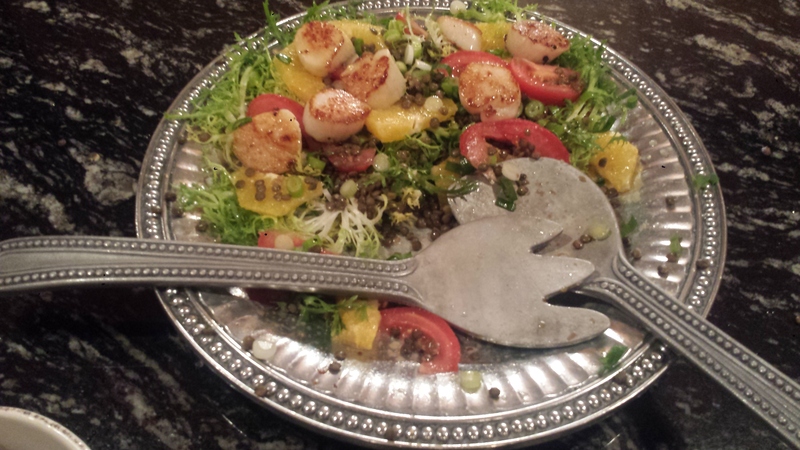 Place a large spoonful of salad mixture on a serving plate and top with 4-6 warm scallops. 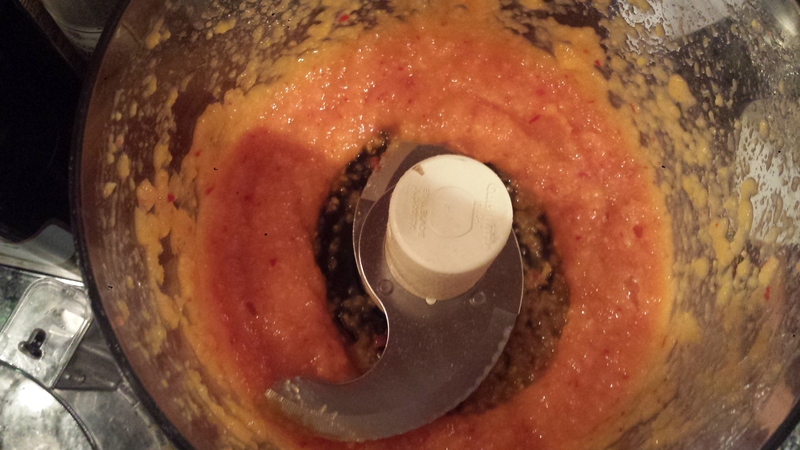 Place mango and chili pepper in a food processor or blender and pulse until it’s finely minced. Add the butter and oil to a wide saute pan on high heat until almost smoking. Add the scallops in a single layer round side down, making sure they are not touching each other and sear for 1 1/2 minutes on each side. 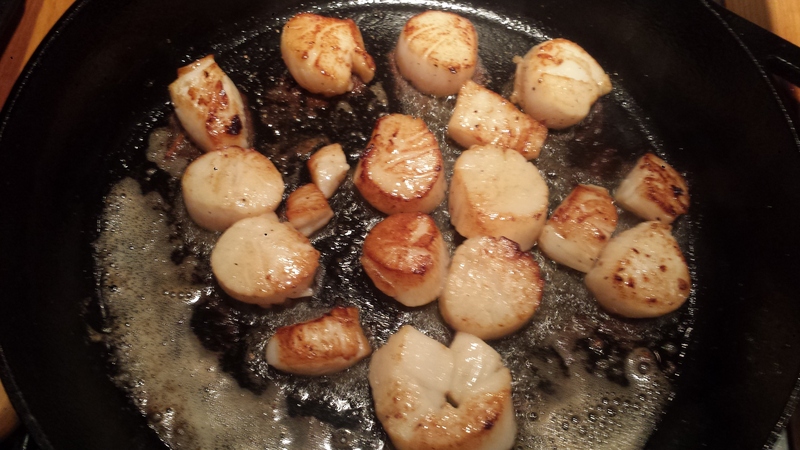 The scallops should be golden brown on both sides but still soft in the center. Don’t overcook or they will get tough and chewy. Add lemon juice and olive oil and process until smooth. In the South, Fried Catfish is usually served with hushpuppies, a yummy fried cornbread-type appetizer. 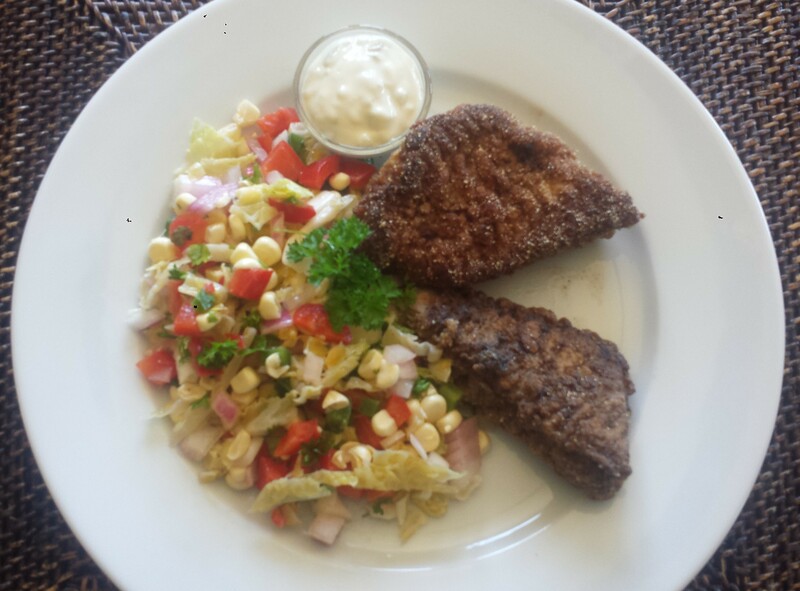 I personally can only do one fried food at a time and decided to balance the fried fish with a light and flavorful slaw made with napa cabbage, fresh sweet corn, red onion, bell pepper and jalapenos drizzled in an oil and vinegar dressing. My corn was sweet enough to eat raw, just cut off the cob. 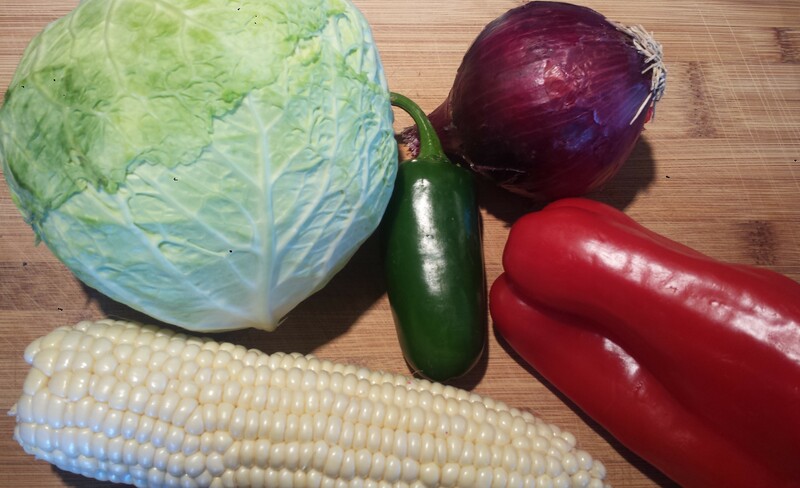 Older corn may need to be steamed or boiled for a few minutes to soften. 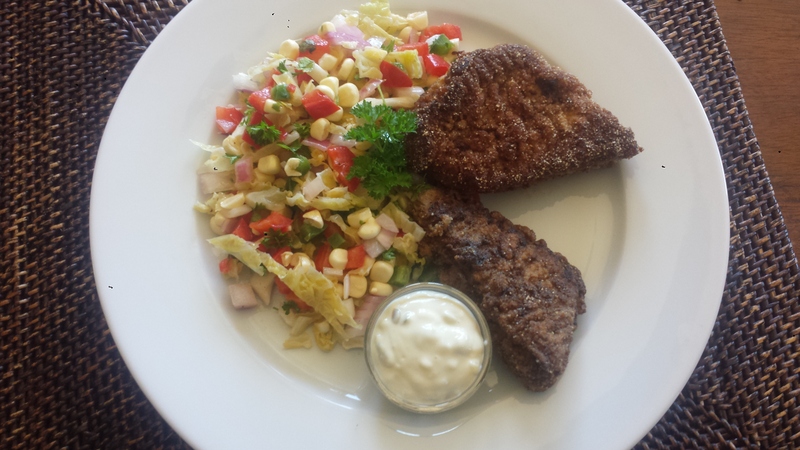 I love the combination of steamy hot crispy fried fish with the cool and spicy slaw. Add a good tartar sauce or aoli and you’re done! So what is a good oil too cook with anyway? Recommendations keep changing, who can keep up? Butter is now a ‘good’ fat for cooking but not for high heat cooking as it contains small amounts of sugars and proteins which makes it burn when overheated. When it comes to high heat cooking, coconut oil is a great choice. 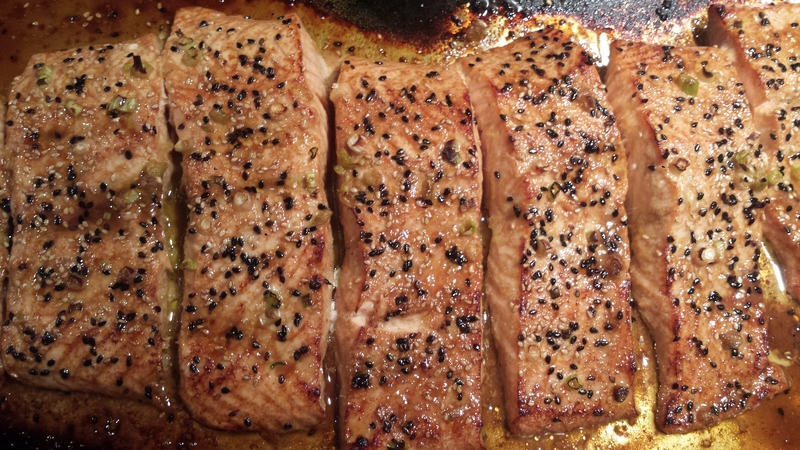 Over 90% of the fatty acids in it are saturated, which makes it very resistant to heat. Avocado and olive oil are good choices too. Oils that are high in polyunsaturated fats should be avoided for cooking, as are fats (even good fats) that go through extreme processing measures. We have an amazing number of choices at the market, no wonder we are confused. 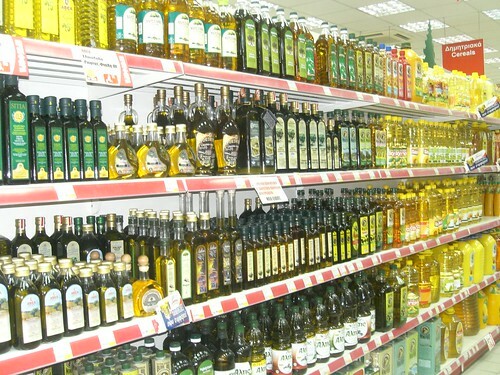 Click HERE for a breakdown on fats and oils, including a list of oils to avoid. TIPS: Prepare the slaw first, if serving, as the taste only improves if it is allowed to sit while you prepare the fish. This recipe calls for catfish, which is so prevalent in the South, but any mild white fish will work as well, like cod or haddock. Just make sure it’s from a Sustainable Seafood Source Use a good quality oil like avocado, coconut or olive oil and you will have a good result. Drain cooked fish on a rack lined with paper towels or newspaper to keep the fish crispy and for easy clean up. 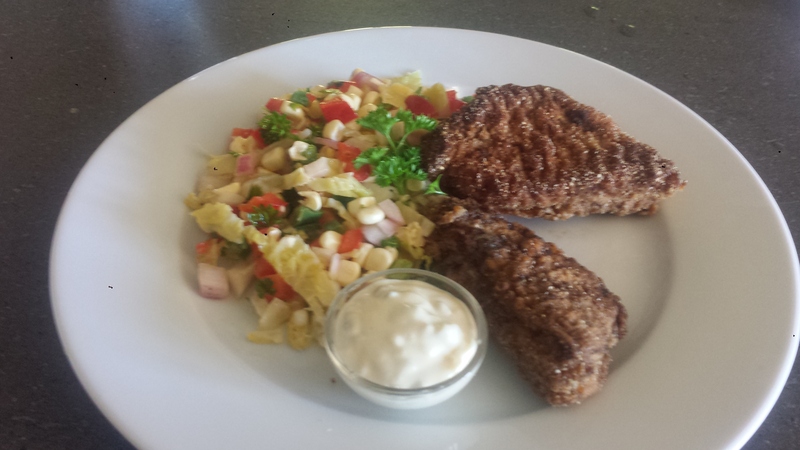 I wanted a true Southern fried fish so went to the Food Network and adapted the recipe for Southern Fried Catfish by Alton Brown to make it wheat/gluten free. For more Southern inspired recipes check out Fried Green Tomatoes with Buttermilk Lime Sauce, Grilled Shrimp and Cheesy Grits or Charred Okra with Tomatoes. Heat the oil in a heavy large saucepan or dutch oven over high heat until it almost reaches the smoking point. If you are using a fryer the temperature should be 350 degrees F on a deep-fry thermometer. Adjust the heat to maintain the temperature. 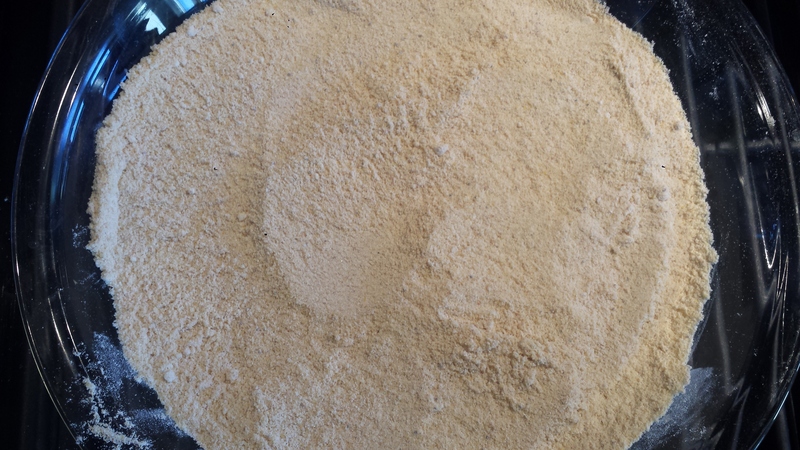 While the oil is heating, whisk the cornmeal and flour together in a shallow dish. 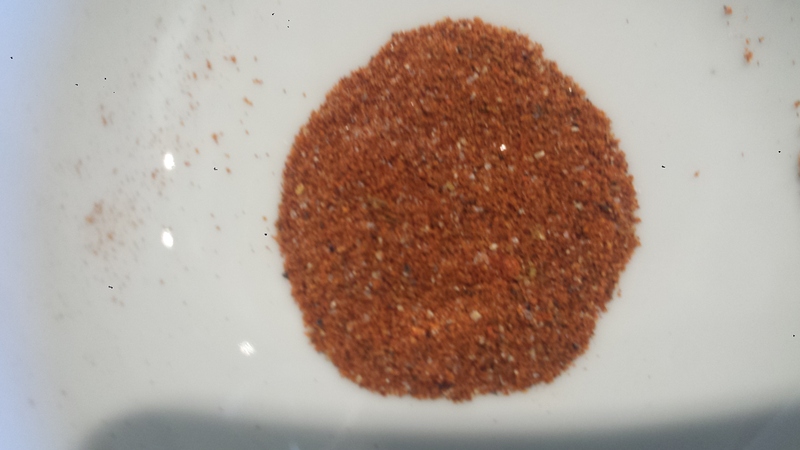 Combine the seafood seasoning, kosher salt, paprika, and pepper in a small bowl. 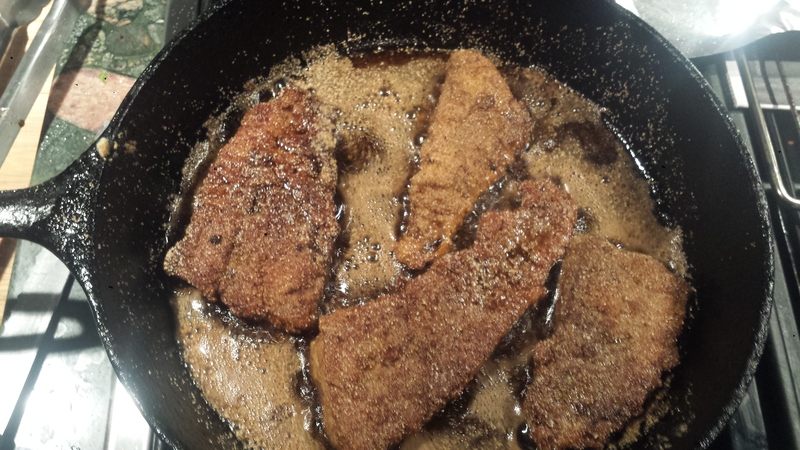 Season the catfish fillets evenly on both sides with the spice mixture. Pour the buttermilk into another shallow dish. Dip each fillet into the egg/buttermilk, flip once to coat both sides, hold over the pan and allow the excess to drip off. 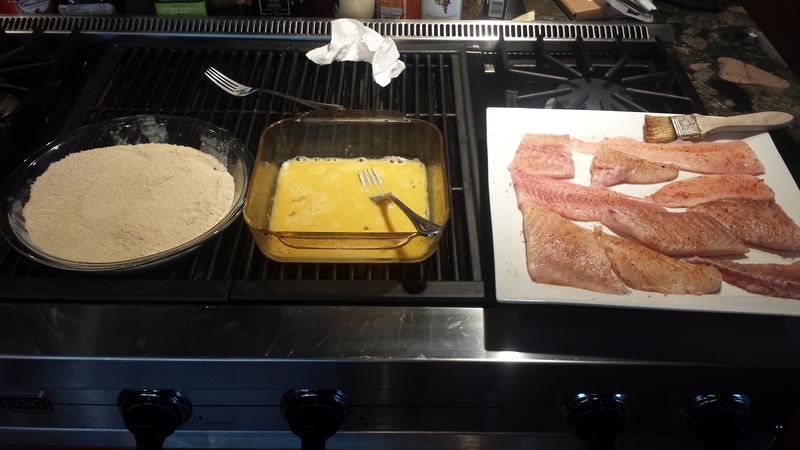 Coat both sides of the fillets in the cornmeal mixture. 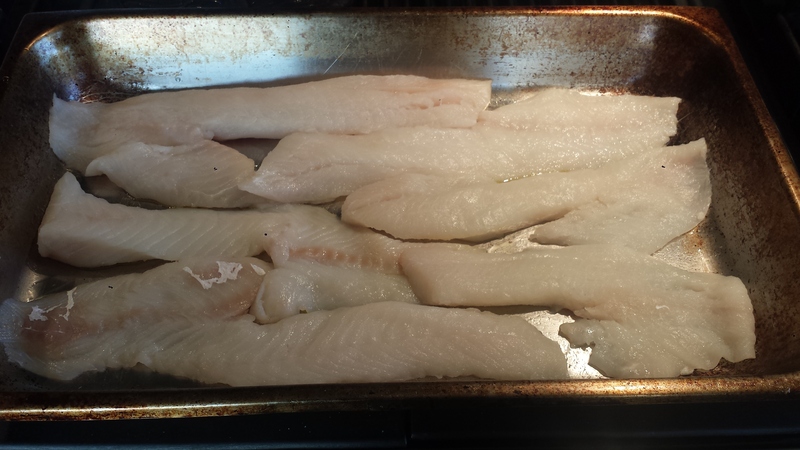 Set the coated fillets on a cooling rack and let rest for 5 minutes. Gently add the fillets, 2-4 at a time, to the hot oil and fry until golden brown, about 5 to 6 minutes. Remove the fried fillets to a cooling rack set over a newspapers or paper towels.. Repeat method with remaining fillets. 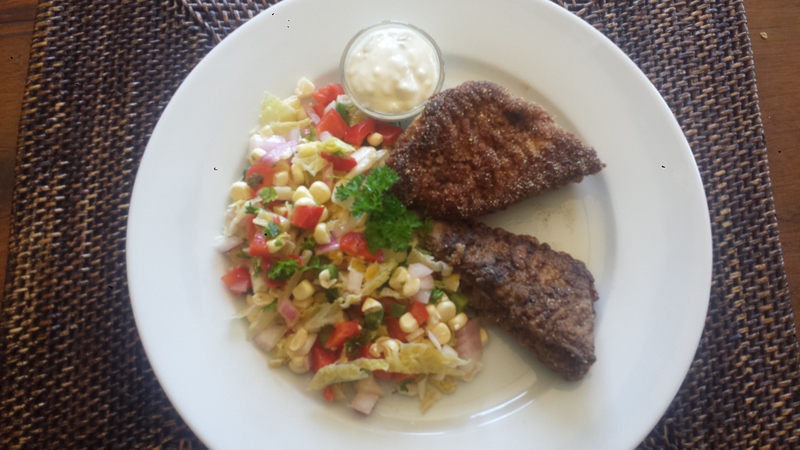 Arrange the catfish on a serving platter and serve immediately with slaw and tartar sauce. Whisk together oil, vinegar, garlic, salt and pepper and set aside. 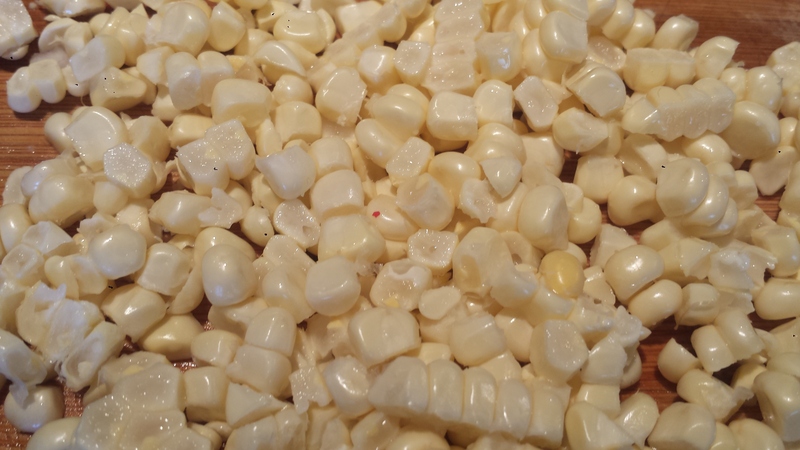 Cut the kernels off the corn with a sharp knife. If they are sweet enough to eat raw, just add to salad. If they are tough, steam them for a few minutes to soften, then let cool. 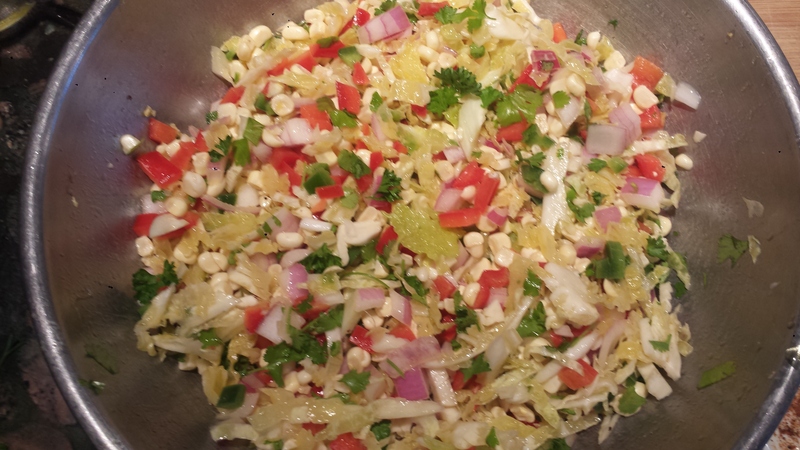 Combine the cabbage, bell pepper, and onion.and toss with the dressing. refrigerate until ready to serve. 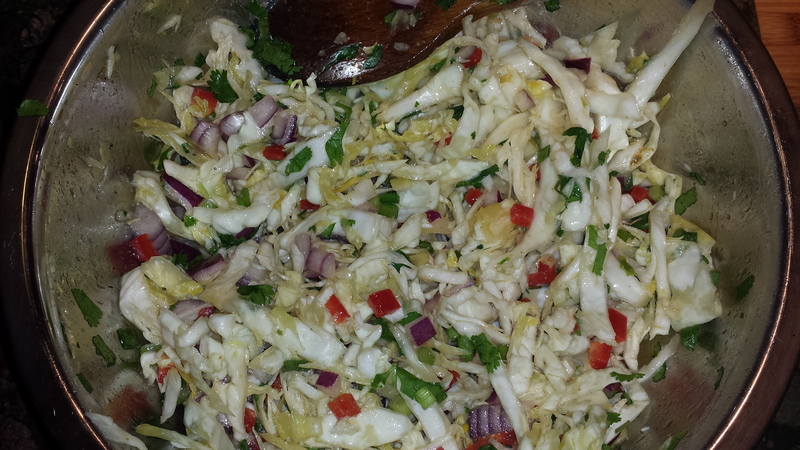 (Slaw tastes best when it’s allowed to rest for an hour or so to allow the flavors to blend.) 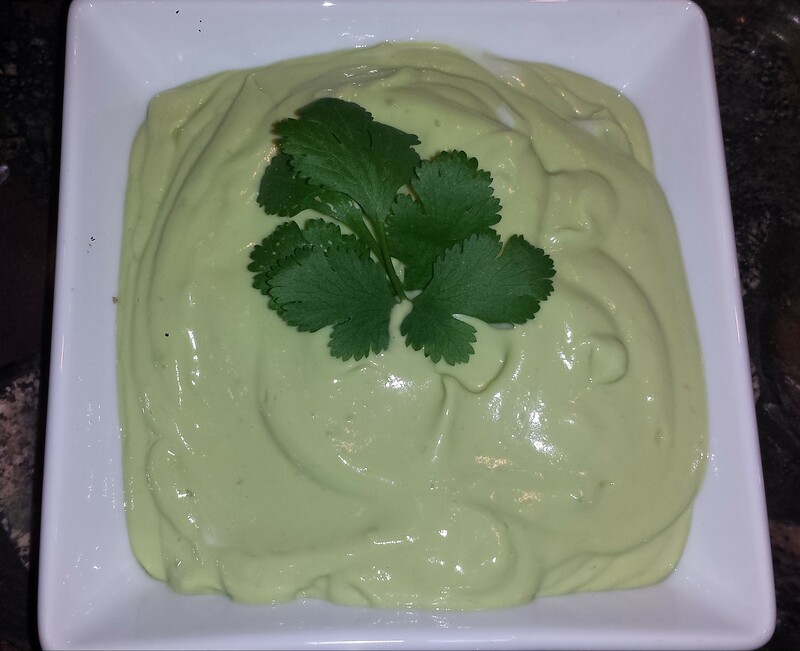 Just before serving, toss with the parsley. Heat the oil in a heavy large saucepan or dutch oven over high heat until it almost reaches the smoking point. If you are using a fryer the temperature should be 350 degrees F on a deep-fry thermometer. Adjust the heat to maintain the temperature. Whisk the cornmeal and flour together in a shallow dish. Combine the seafood seasoning, kosher salt, paprika, and pepper in a small bowl. 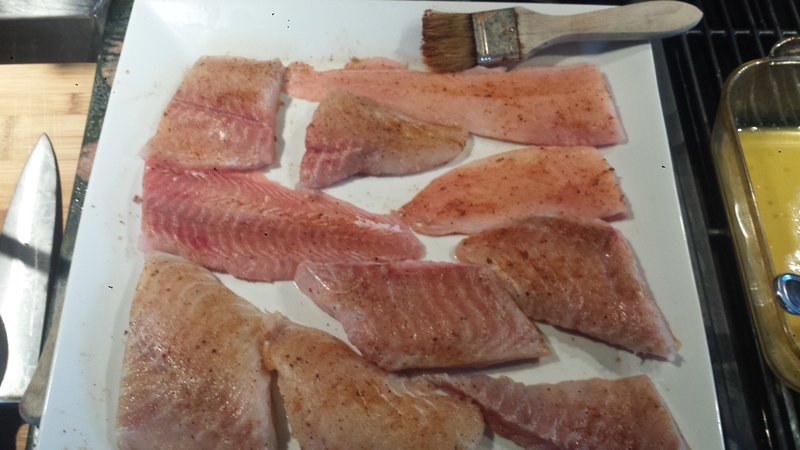 Season the catfish fillets evenly on both sides with the spice mixture. Pour the buttermilk into another shallow dish. Dip each fillet into the buttermilk, flip once to coat both sides, hold over the pan and allow the excess to drip off. Coat both sides of the fillets in the cornmeal mixture. 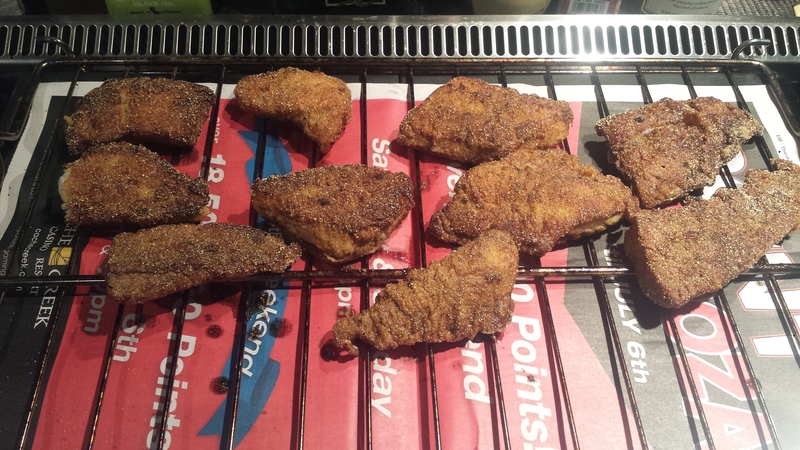 Set the coated fillets on a cooling rack and let rest for 5 minutes. When I think about Mediterranean food, I picture of bowls of briny, herbed olives, tomatoes and marinated vegetables with fresh mozzarella and fruity red wine served outside in a warm but shady spot in the garden. A fantasy? Perhaps, but not if you are in Southern Italy – or pretending to be… We have all heard about the heart healthy benefits of eating a Mediterranean diet, but what is it? This delicious recipe, which I adapted from from Real Simple, is Mediterranean in flavor and ingredients. 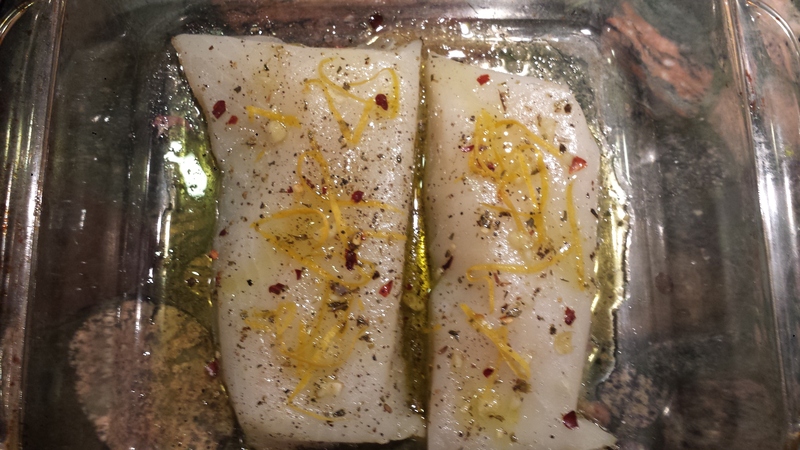 A light, white fish like cod, halibut or seabass is drizzled with olive oil, sprinkled with olives, lemon zest and red pepper flakes then roasted in white wine. 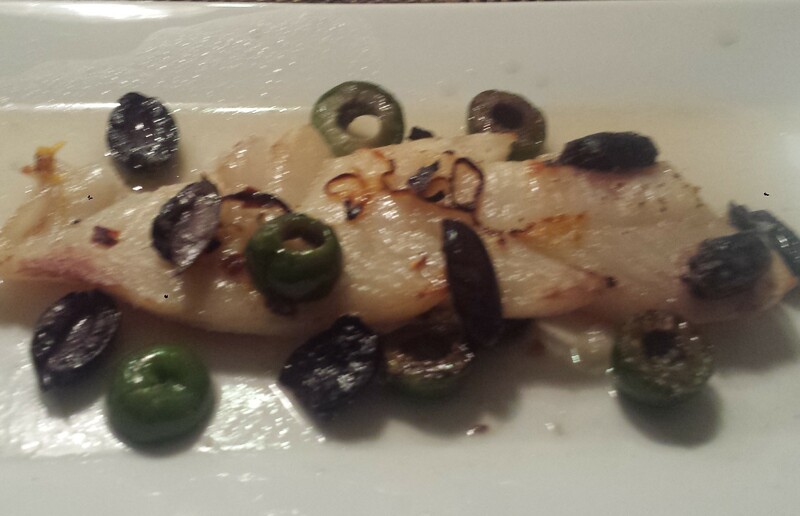 I used both castelvetrano and kalamata olives. I love their color combination but they both have different flavors to offer. Castelvetrano olives originate in Sicily and they are sweet and buttery while Kalamatas, from Southern Greece, are rich and meaty. 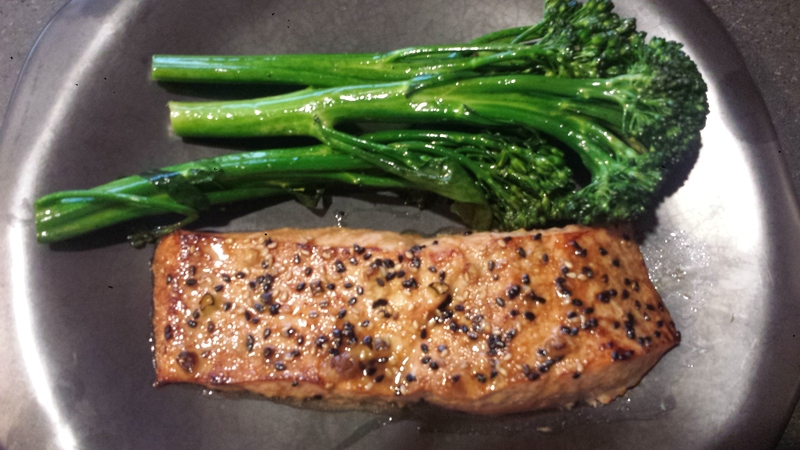 The resulting dish is simple but flavorful and takes less than 30 minutes, start to finish. 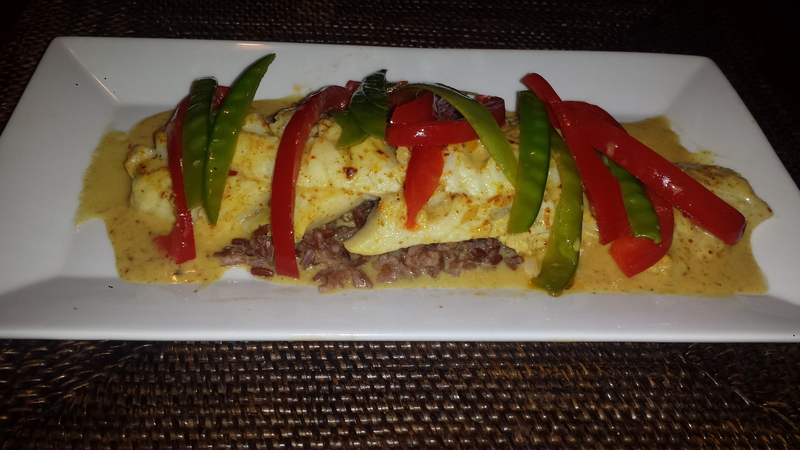 Roasted Pacific Cod can be served with a salad for a light entree or over a bed of couscous or rice for a heartier meal. Don’t forget to spoon some of the yummy wine sauce over the top! TIPS: When choosing fish from the market, make sure it’s considered a healthy and sustainable source. The easiest way to do so is to go to the Seafood Watch website and enter the name of the fish you are considering. You will get an instant response, Best Choice, Good Alternative or Avoid. They also offer a handy Phone App so you can type it in while you are in line at the seafood counter. For example, Seafood Watch tells me that Pacific Cod which is live caught in the U.S. is considered Best Choice, whereas, Pacific Cod from Japan and Russia and some of Atlantic Cod is rated Avoid due to poor or unknown health of cod populations or questionable fishing practices. Seafood Watch is a great tool and I highly recommend it. I use it all the time. Non olive lovers can omit the olives or substitute marinated red peppers, slivered marinated artichokes, or even capers, especially the large ones. 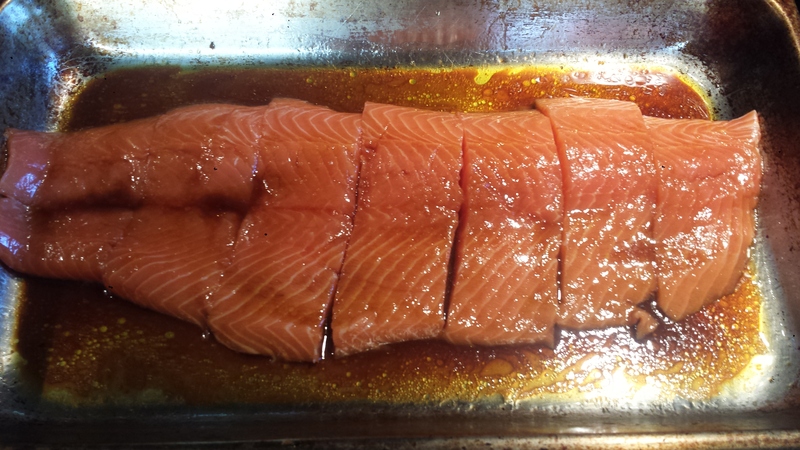 Preheat oven to 400° F. Rinse and dry fish and place the fish in a single layer in a roasting pan. 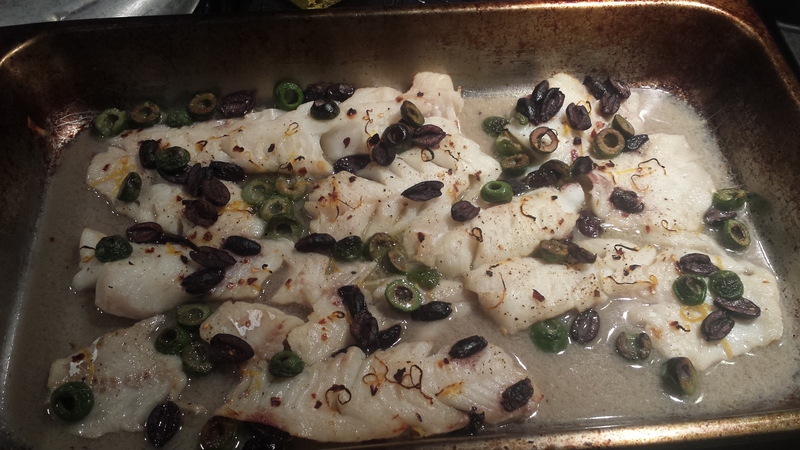 Add enough wine to reach halfway up the sides of the fish. 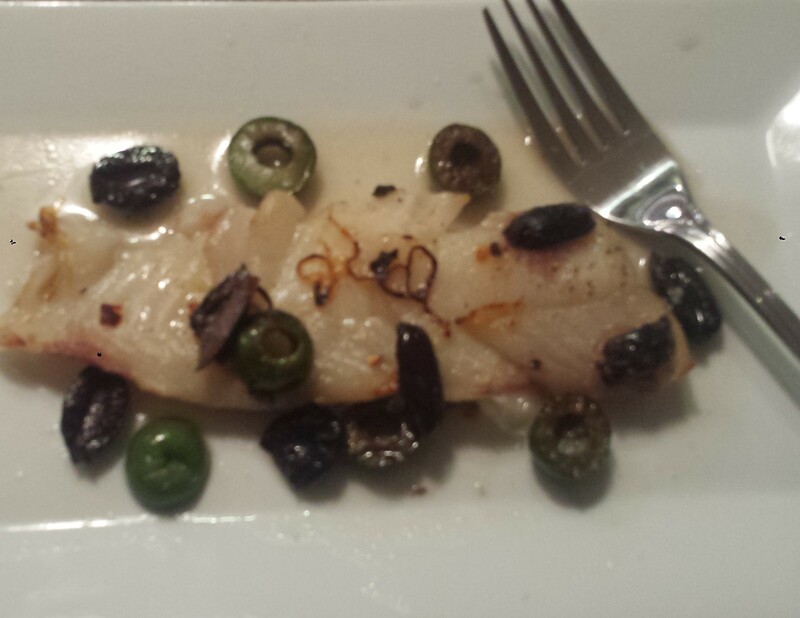 Scatter the olives and lemon zest on top of the fish. 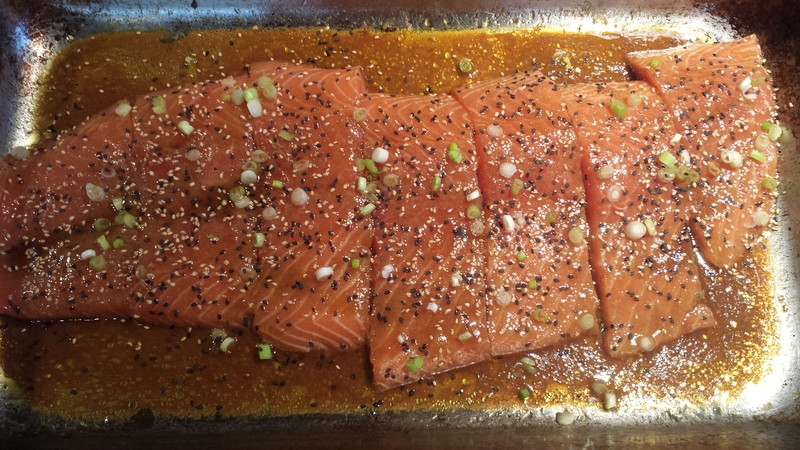 Drizzle with the oil and season with salt, pepper and the red pepper. Roast until the fish is cooked through and flakes easily with a fork, about 10 minutes (longer depending on thickness of fish). 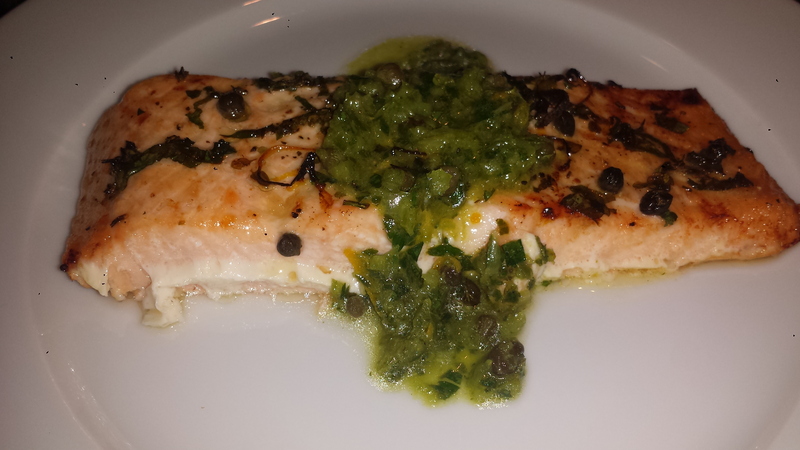 Sprinkle with the parsley and divide the fish among individual plates and spoon the olives and wine sauce over the top. 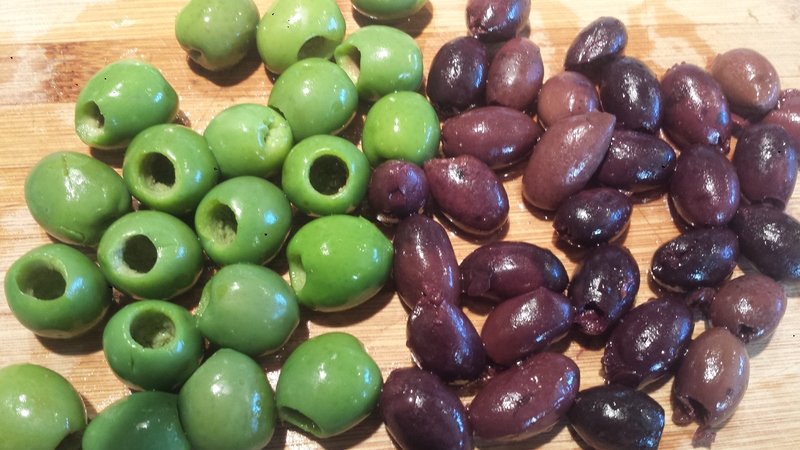 Preheat oven to 400° F. Slice olives in half and set aside. 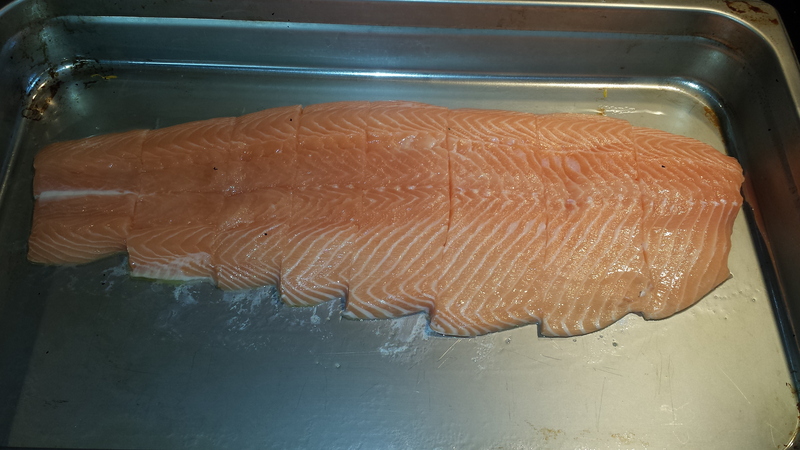 Rinse and dry fish and place the fish in a single layer in a roasting pan. 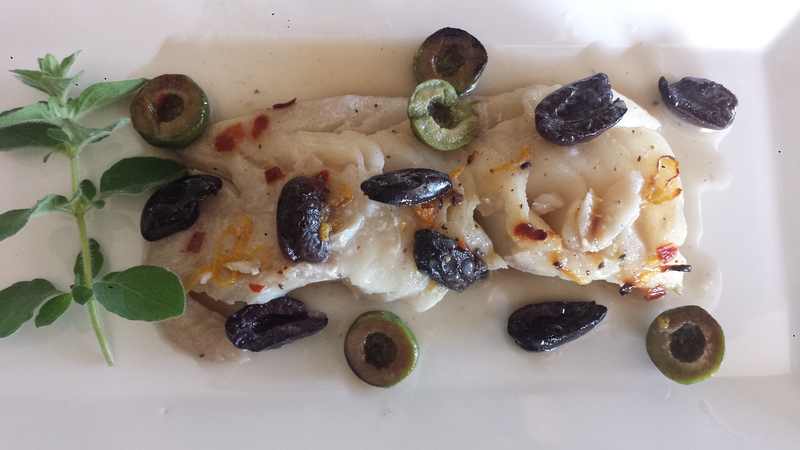 Divide the fish among individual plates and spoon the olives and wine sauce over the top. It can be daunting to wade through all of the information out there about what we should be eating. Between fad diets, sale prices, ambiguous terms like “natural” or “safe”, and convoluted ingredient labels, “good” and “bad” food have fallen into an ever-expanding grey area. When it comes to seafood, it can be even more difficult to discern what the “right” purchases are. Many times, the public is unaware of the plight facing our world’s oceans. Some of our seafood is unsafe to eat due to farming practices and/or polluted water and other species are at risk of extinction due to overfishing. Luckily, we don’t have to research everything ourselves, as others have already taken on that challenge. Seafood Watch has also partnered with this project to provide more information on the sustainability of our seafood. I have long relied on Seafood Watch for guidance while in the grocery store on which fish or shrimp is “Best Choice”, “Good Alternative” or “Avoid”. It’s easy – just click on the website and type in the name of the seafood you are contemplating and you will get an instant, informed response. Here is their recommendation from March,2014, but check the site as a few things may have changed since then. 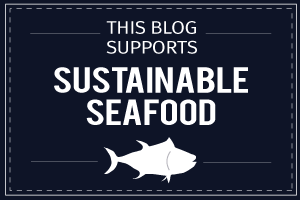 So the way I see it, we can still enjoy seafood as long as we make good, informed purchases. As your Mother used to tell you, “Make good choices.” How does Coconut Curry Fish with Red Ginger Rice sound? I love coconut curry with almost anything but I have never made it for fish. I created this curry with red curry paste which is warm and mildly spicy rather than green, which is very spicy and I thought it might overpower a delicate fish. 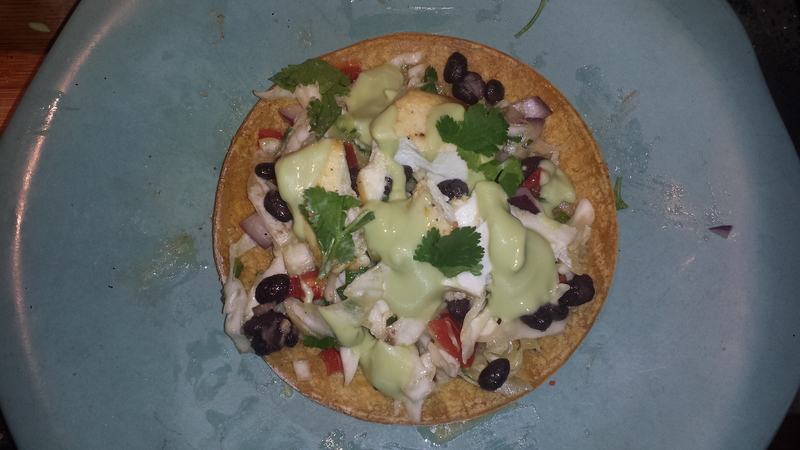 I used Pacific Cod (live-caught in the U.S.) which is considered ‘Best Choice’ by Seafood Watch. Cod is a light, white fish that is adaptable to many recipes, however other good choices might be halibut, rockfish and salmon. 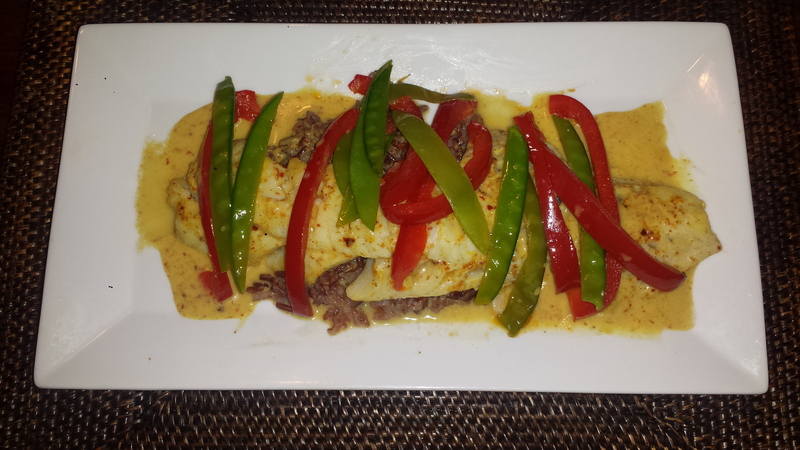 This red curry sauce is so tasty you will want to serve the fish on something to soak it up. I really like it with red or black rice, both of which are dense and chewy but brown rice would be another good choice. 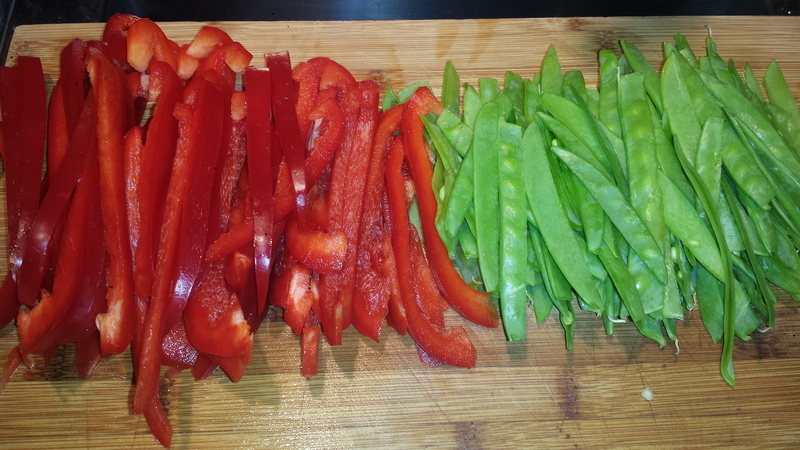 The red bell pepper and snow peas add color and interest. 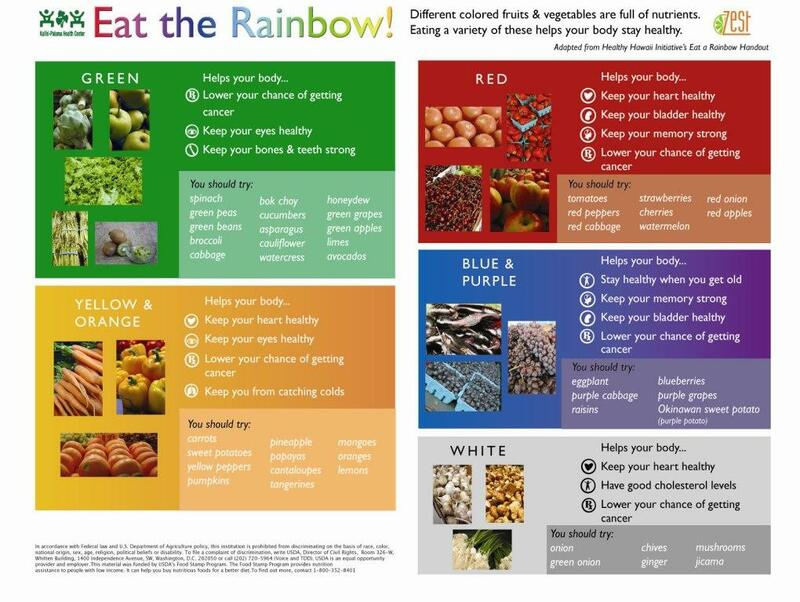 Other veggies to consider would be zucchini, carrots or green bell pepper. I love a color contrast. TIPS: I like really spicy food so I added red pepper flakes. For a milder dish, leave them out and use less curry powder, or turn them both up for even more heat. In making ginger rice, I add a one inch piece of fresh peeled ginger to the water as it’s cooking and then remove it before serving. This is an optional step but it adds a nice gingery flavor to the rice without too much extra work. 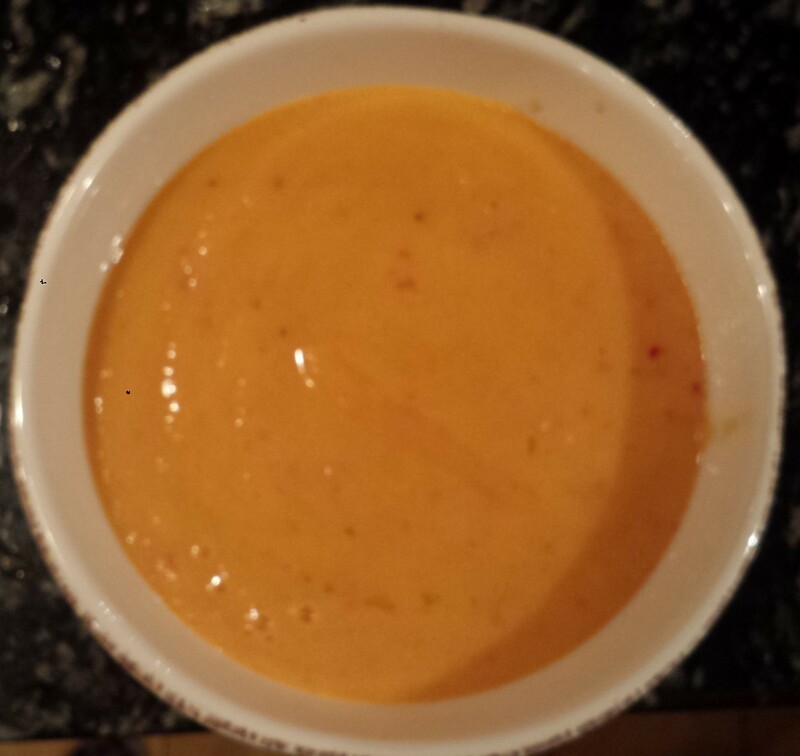 Combine coconut milk, fish sauce, curry powder and paste, garlic, red pepper flakes and lime juice in a small bowl. 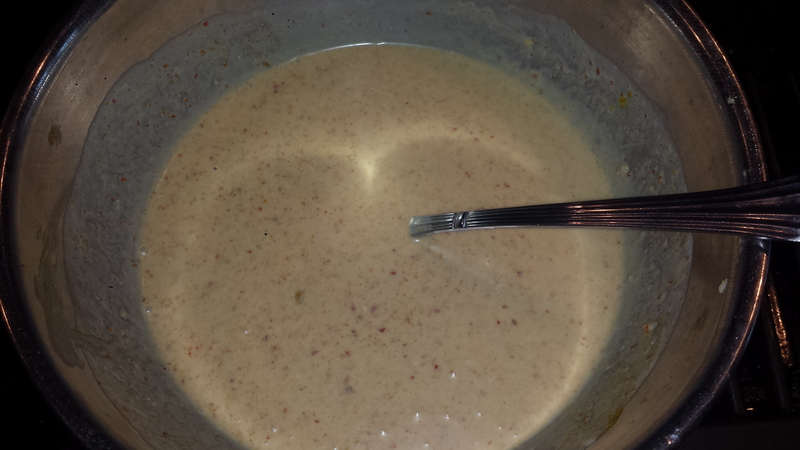 Pour coconut curry sauce over fish and lift each piece to allow sauce to cover the underside. 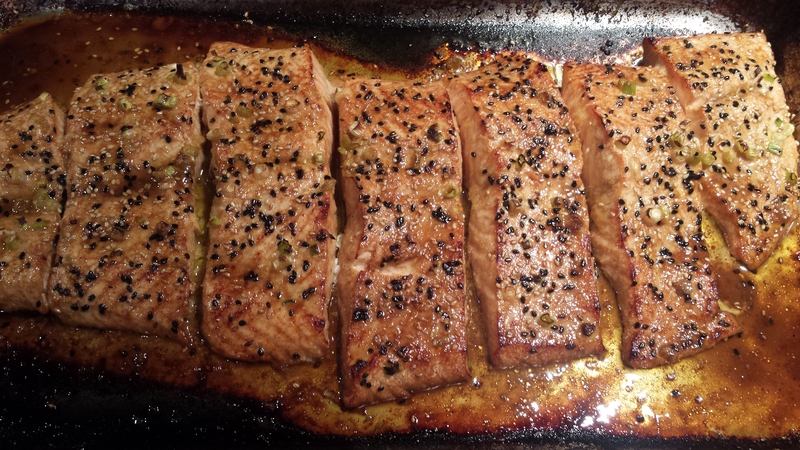 Bake fish at 450 degrees for about 5 minutes. 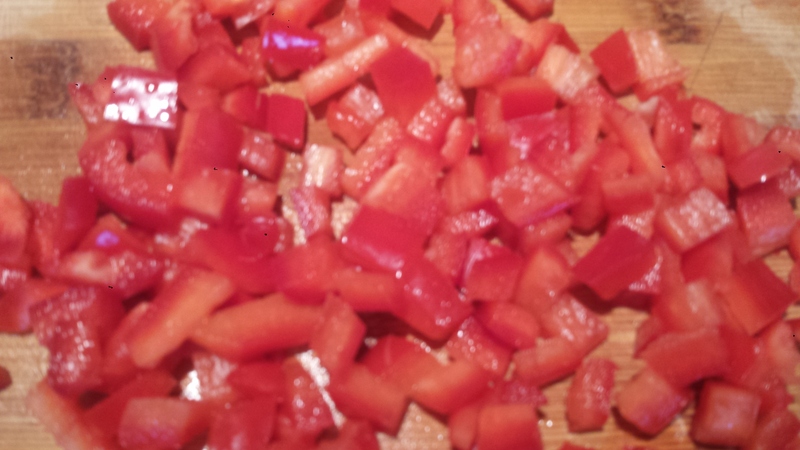 While fish is cooking, slice red bell pepper and sugar snap peas into thick julienne and saute in olive oil, with salt and pepper and a minced clove of garlic on medium heat 4 or 5 minutes or until softened but still al dente and brightly colored. Remove from heat. Spoon sauce over the fish and broil for another 5 minutes. Fish should be opaque in the center and the sections beginning to pull apart. 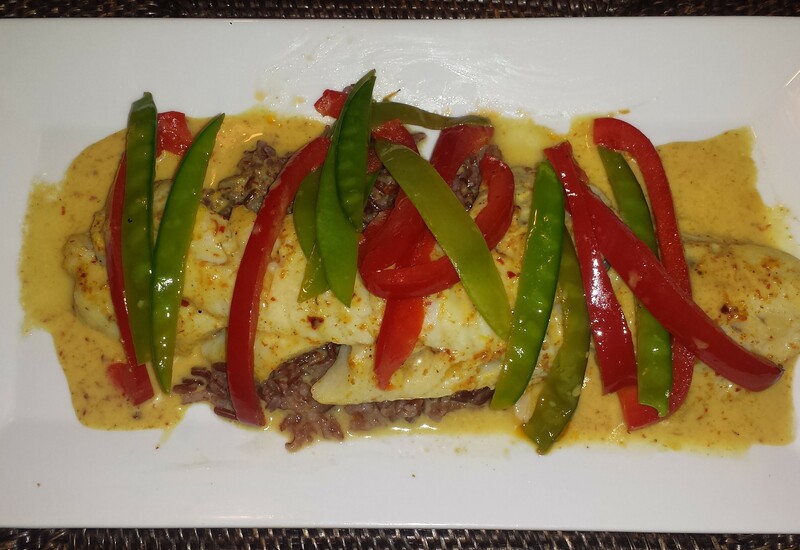 To serve, place fish on a bed of rice, spoon sauce over the top and dress with veggies. 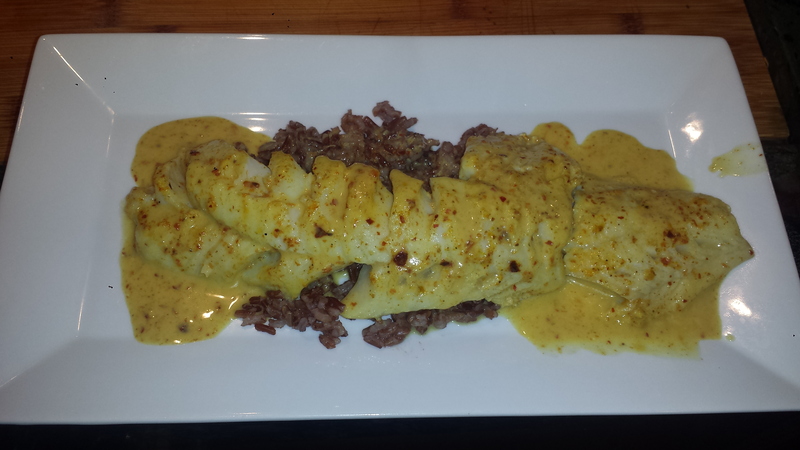 Pour coconut curry sauce over fish and lift each piece to allow sauce to cover the underside. Cook rice according to instructions using vegetable broth instead of water for added flavor. Throw in a piece of peeled garlic but remove before serving. 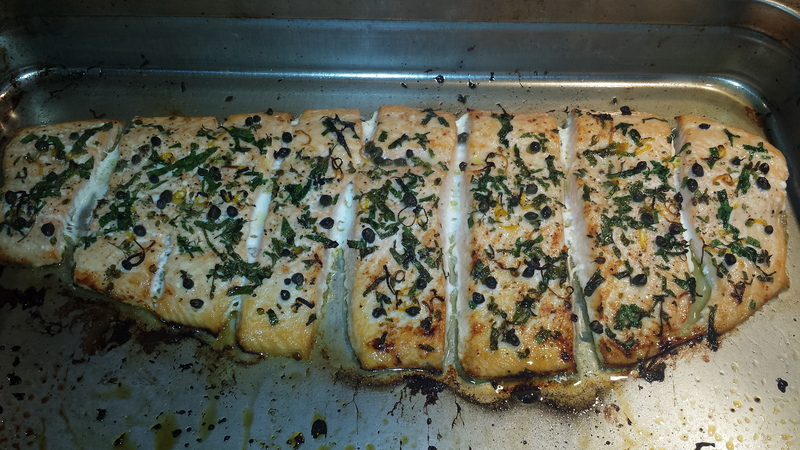 Bake fish at 450 degrees for about 5 minutes. 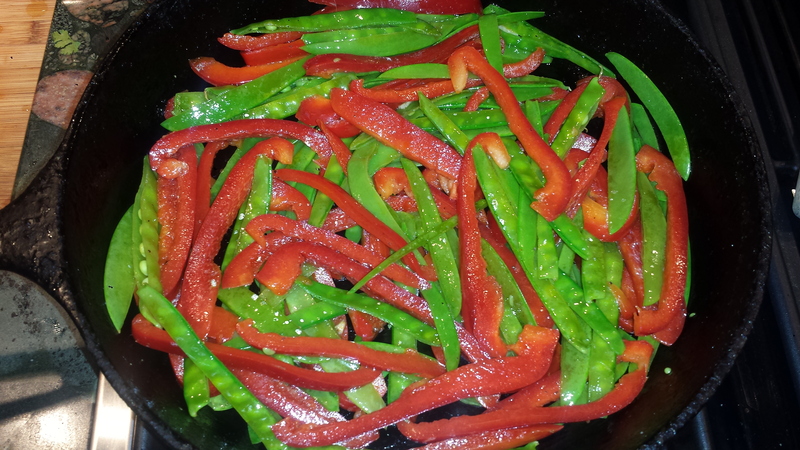 While fish is cooking, slice red bell pepper and sugar snap peas into a thick julienne and saute in olive oil, with salt and pepper and a minced clove of garlic on medium heat 4 or 5 minutes or until softened but still al dente and brightly colored. Remove from heat.